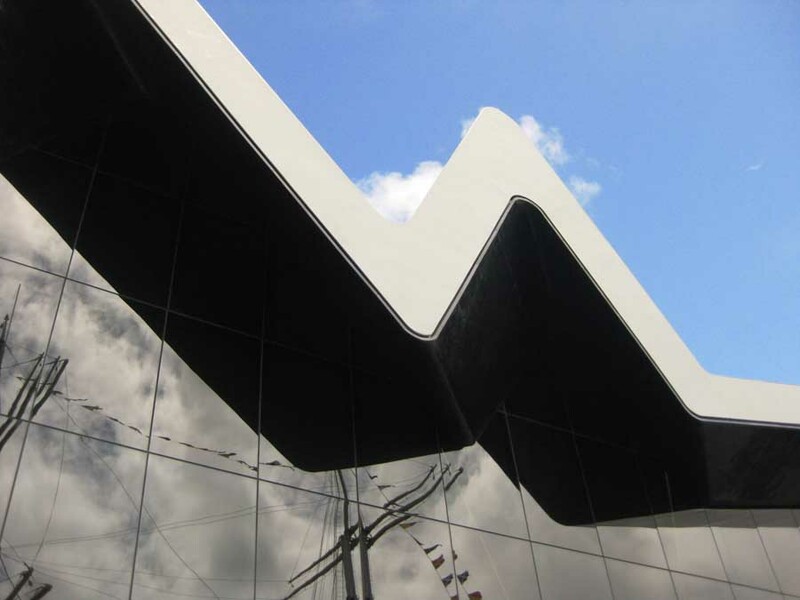 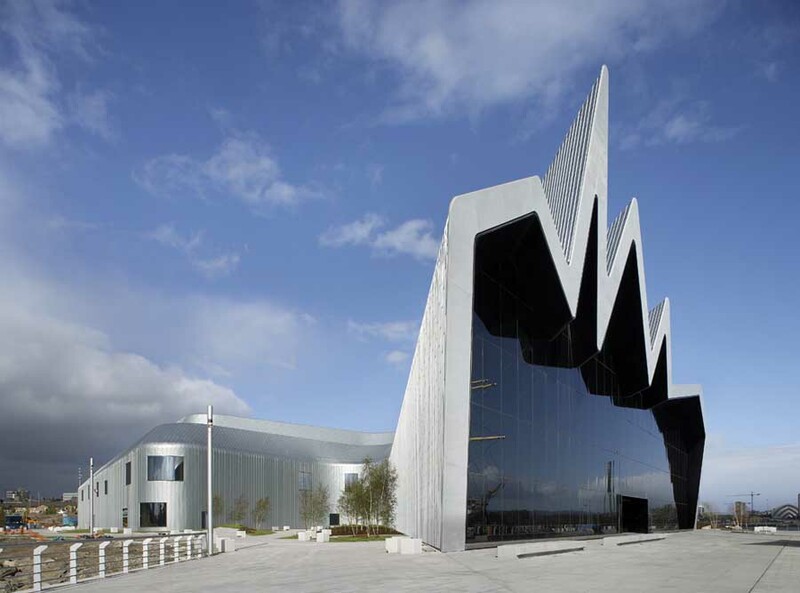 Riverside Museum Architect Zaha Hadid dies unexpectedly in the USA. 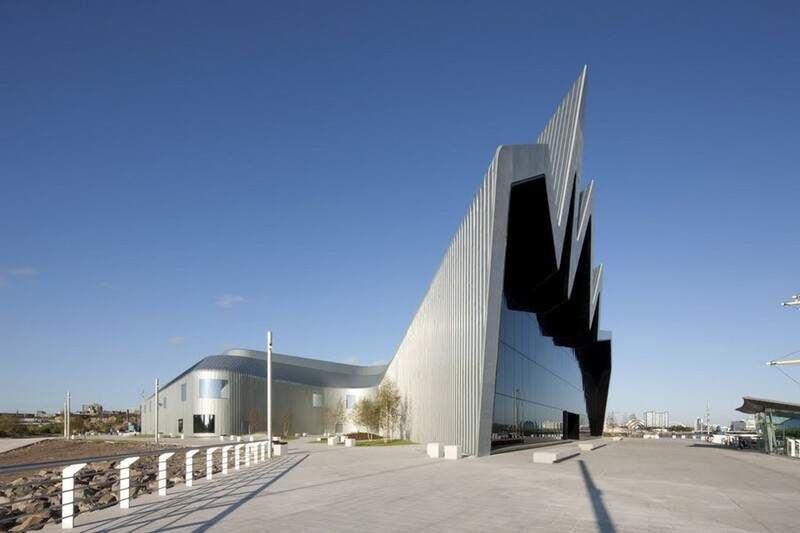 The Riverside Museum, Glasgow by Zaha Hadid Architects has won the European Museum of the Year Award (EMYA) at ceremony in Tongeren, Belgium. 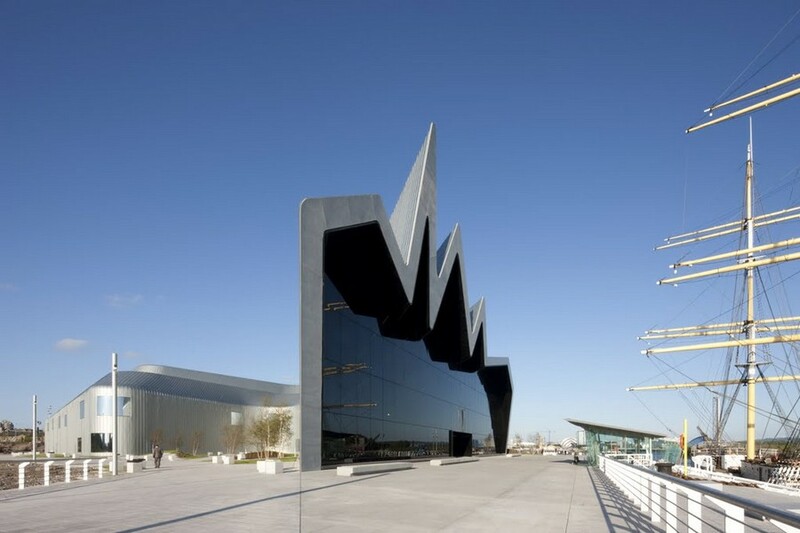 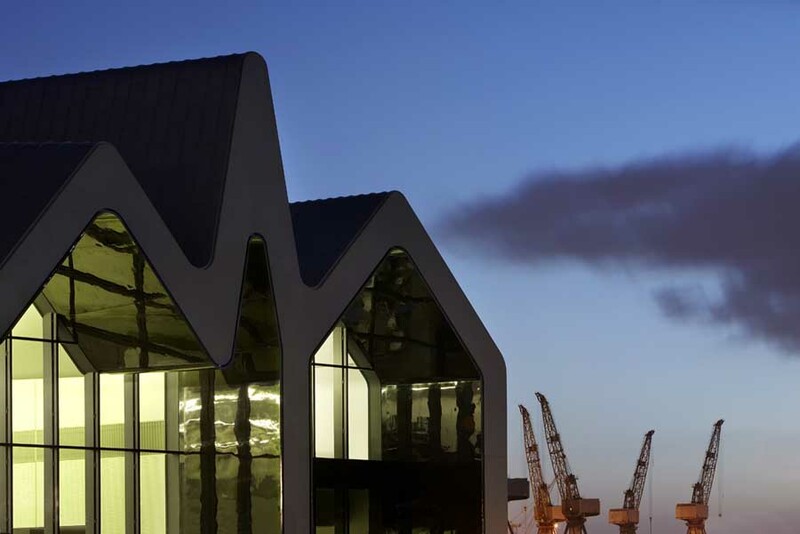 Since its opening, over two million people have visited the new Riverside Museum which showcases Glasgow’s transport, shipbuilding and engineering heritage. 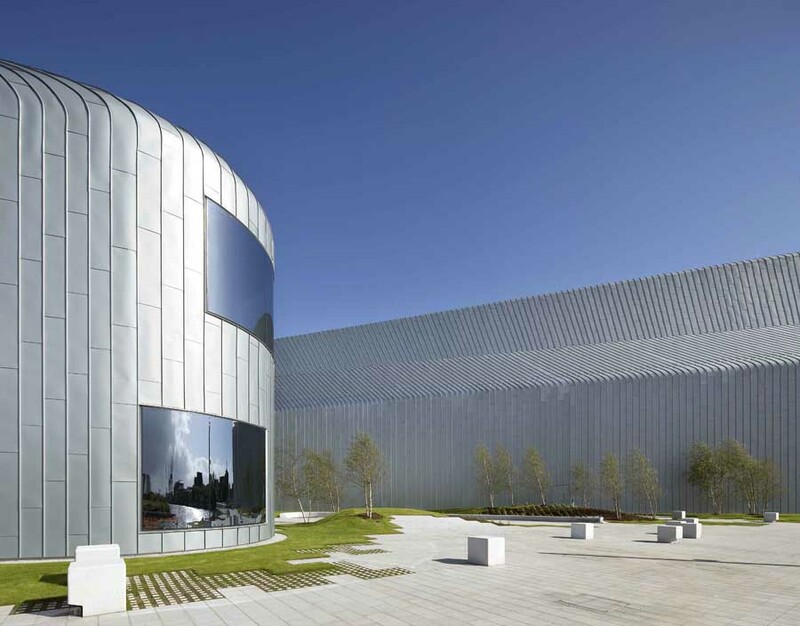 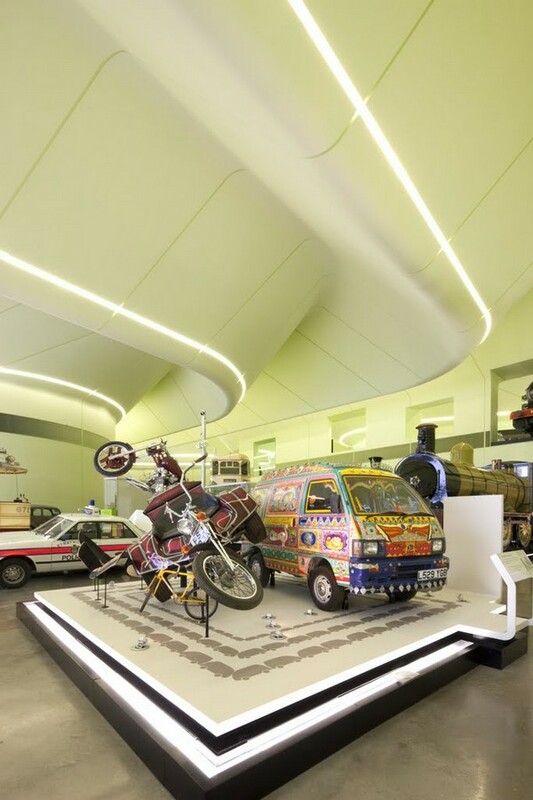 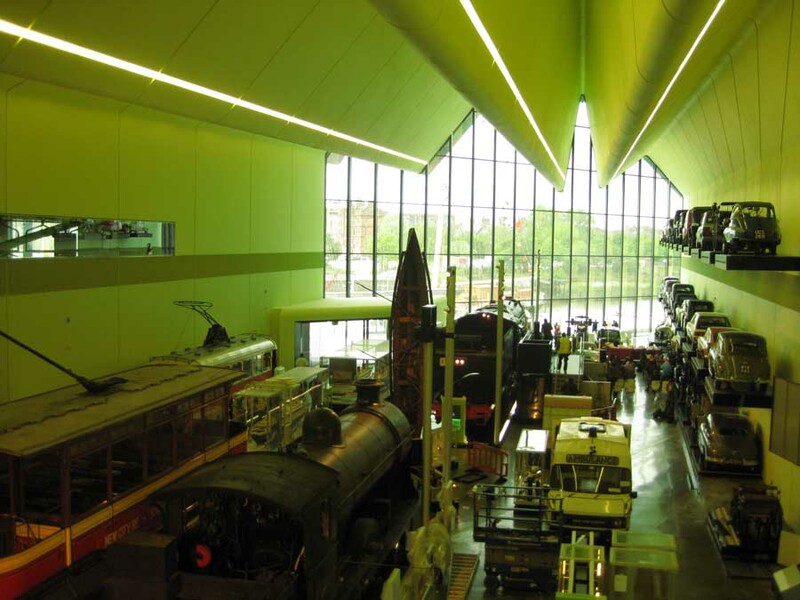 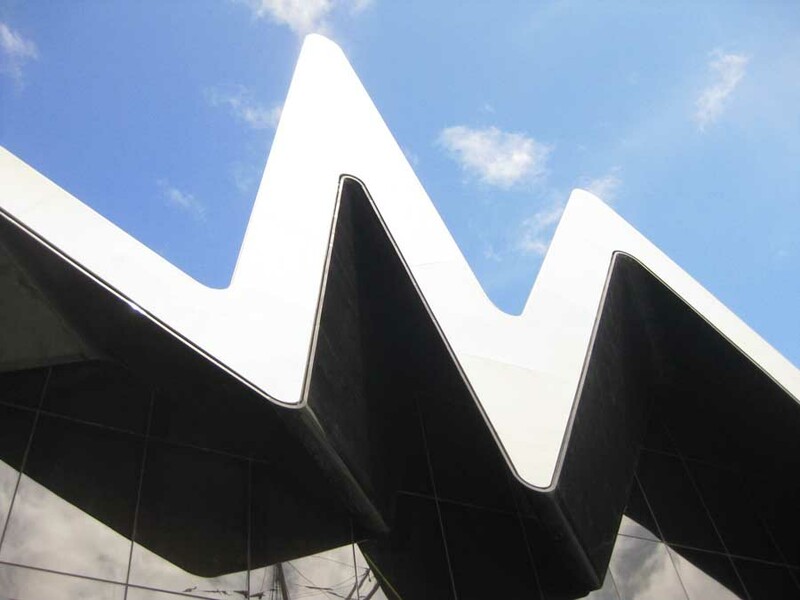 Riverside Museum, Glasgow has been named the most innovative museum in the fields of technology, labour and social history by the European Museum Academy. 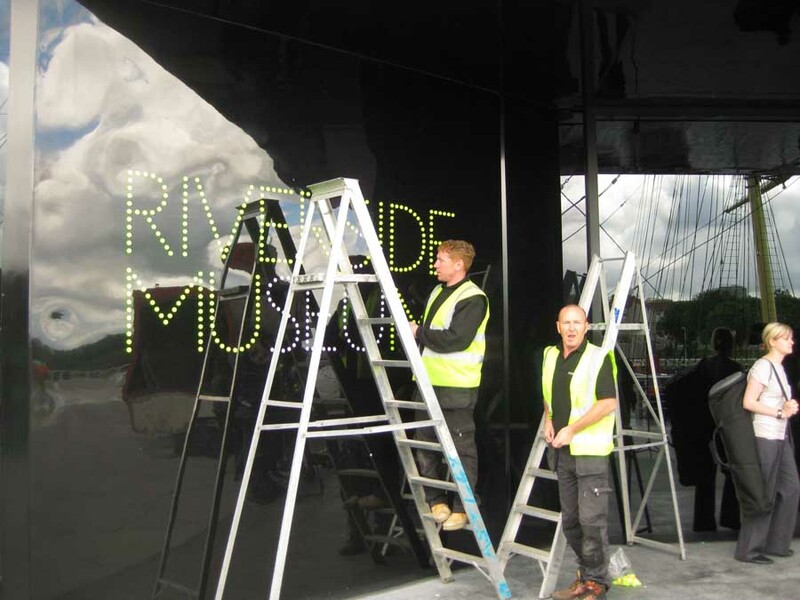 Riverside competed against museums in 12 other European countries to win the 17th annual Micheletti Award. 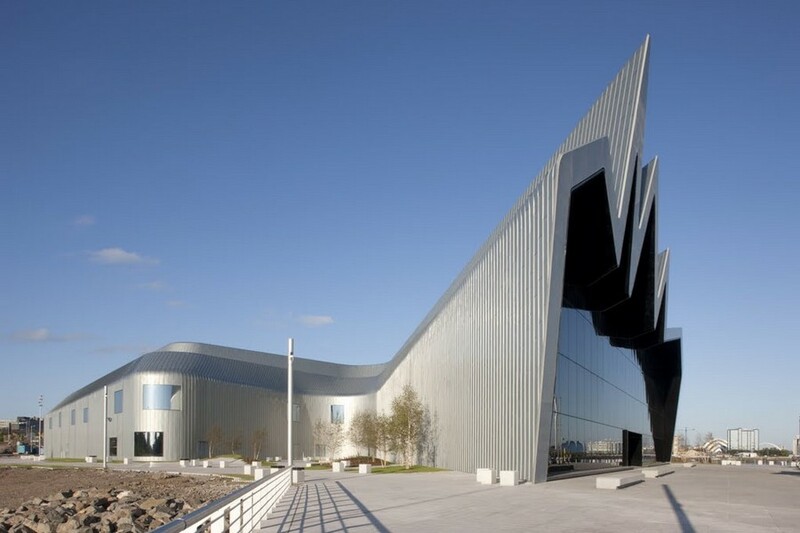 Riverside Museum has already attracted more than 1.4million visitors since opening in June. 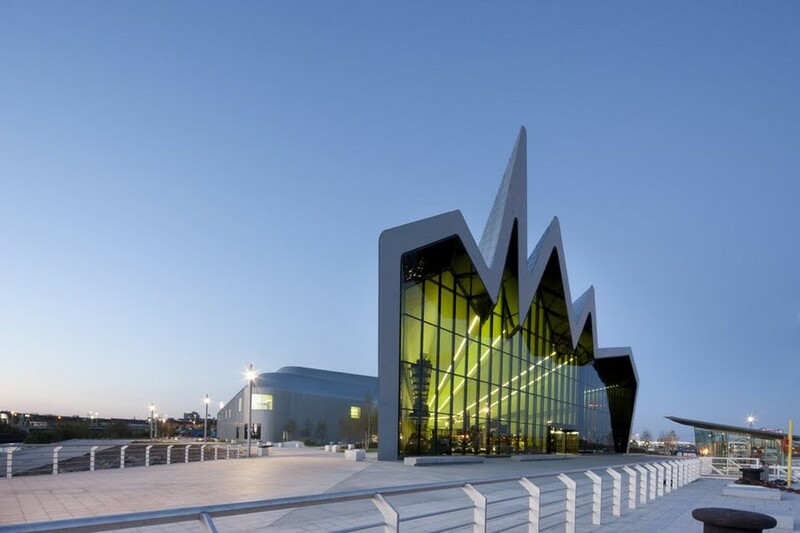 Glasgow City Council leader Gordon Matheson smashed a ceremonial bottle of champagne on the side of the riverside building, which houses the city’s vast of transport and travel collection. 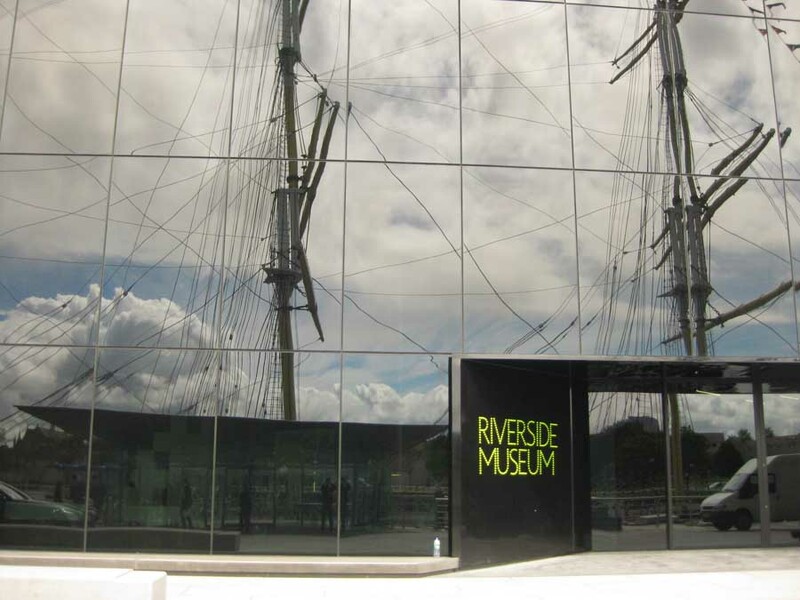 Despite heavy rain, by the time the Riverside Museum opened, at 10am, around 100 people had queued up. 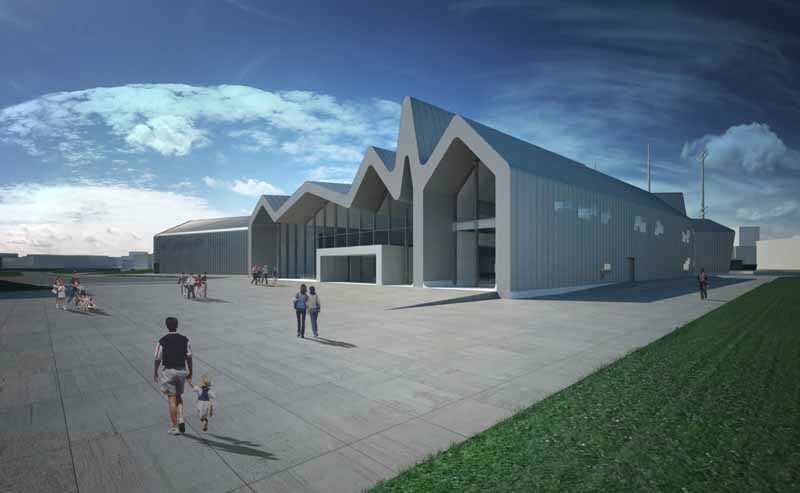 The Riverside Museum has been funded by the City Council, the Heritage Lottery Fund and the Riverside Museum appeal. 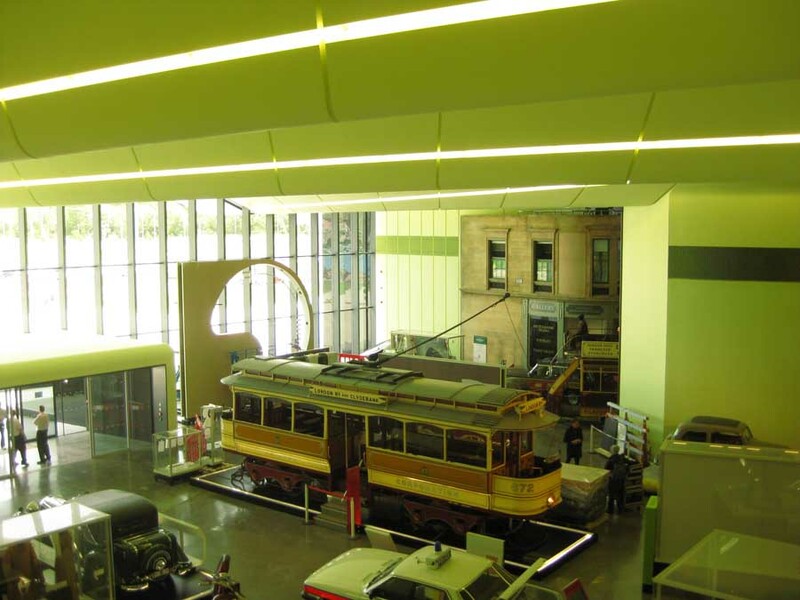 Like all of the city’s 10 civic museums, admission is free. 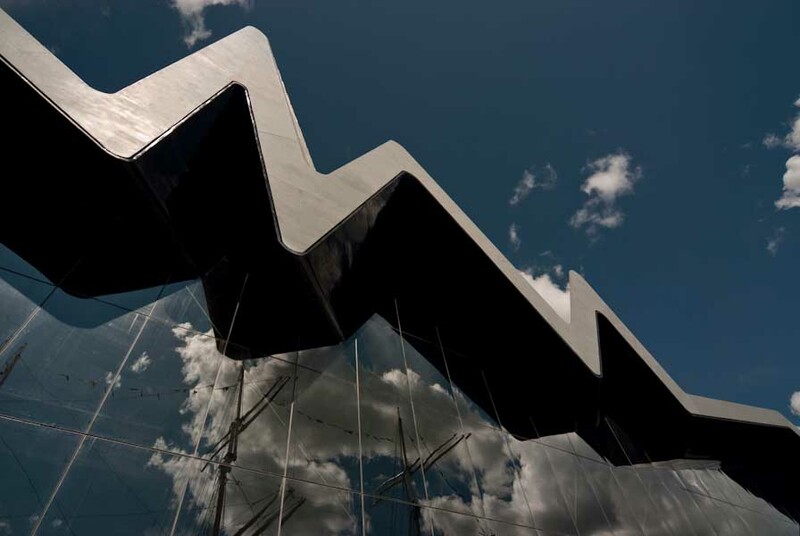 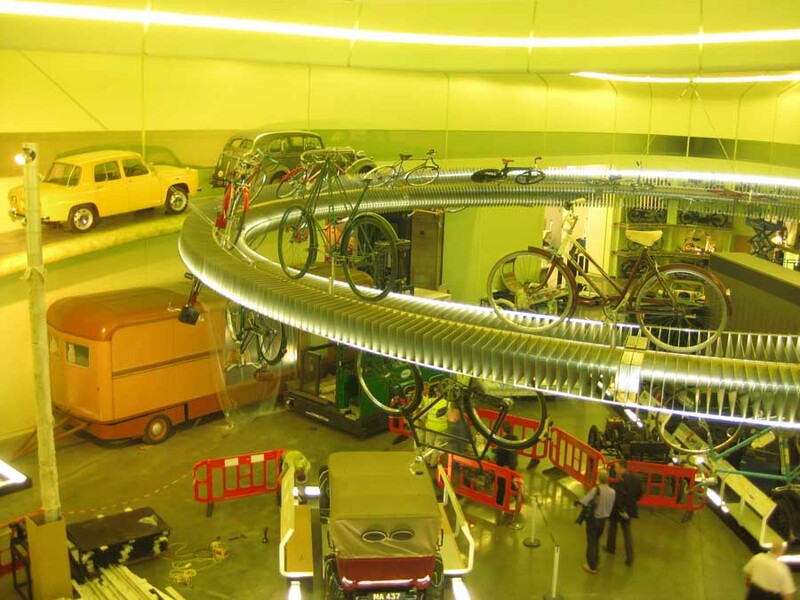 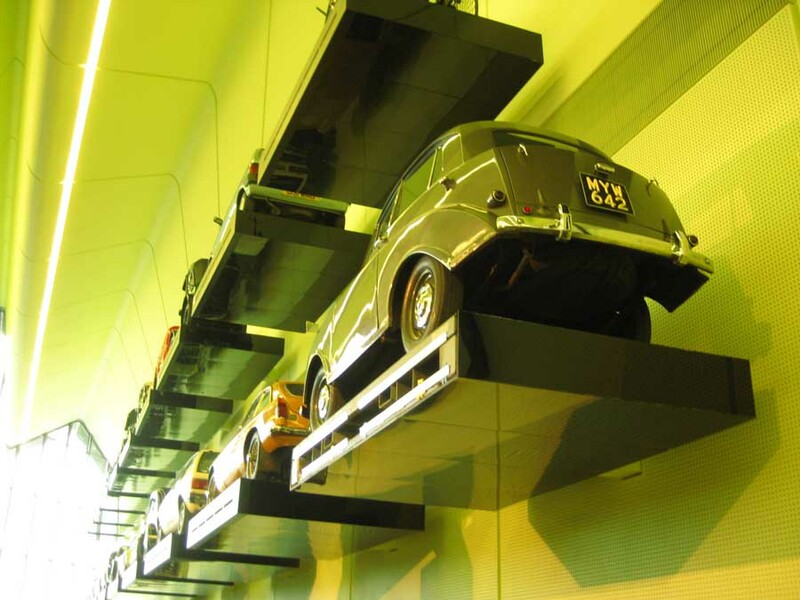 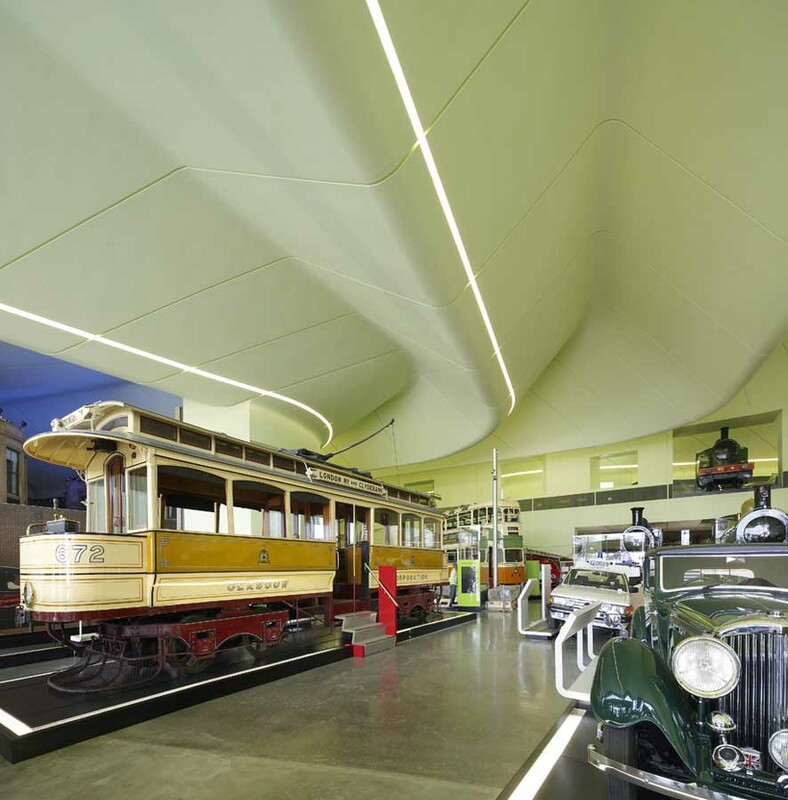 The Riverside Museum replaces Glasgow’s former Museum Of Transport, the second most visited transport museum in the UK with an average of 500,000 visitors a year. 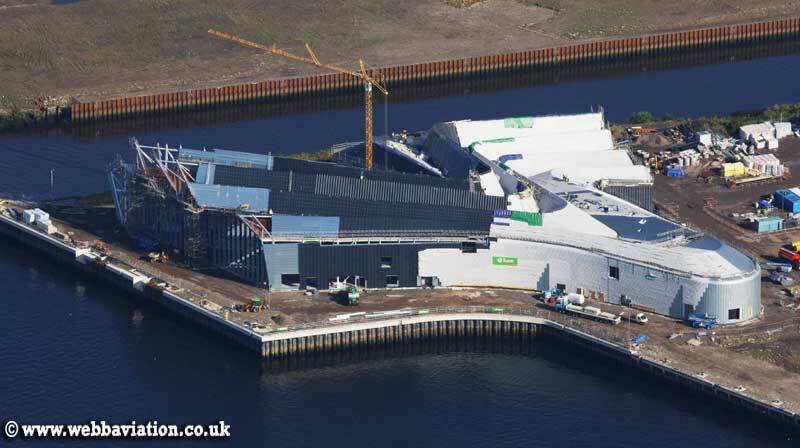 It is expected 800,000 people will visit the new attraction in its first year. 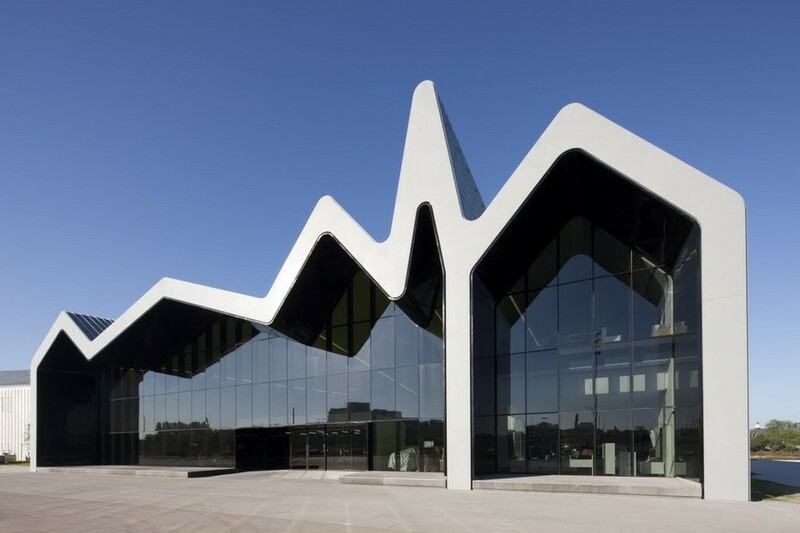 Review by e-architect of today’s press preview with Zaha Hadid + 25 professional photos + 26 photos (from selection of over 100) by e-architect of the Glasgow Transport Museum online. 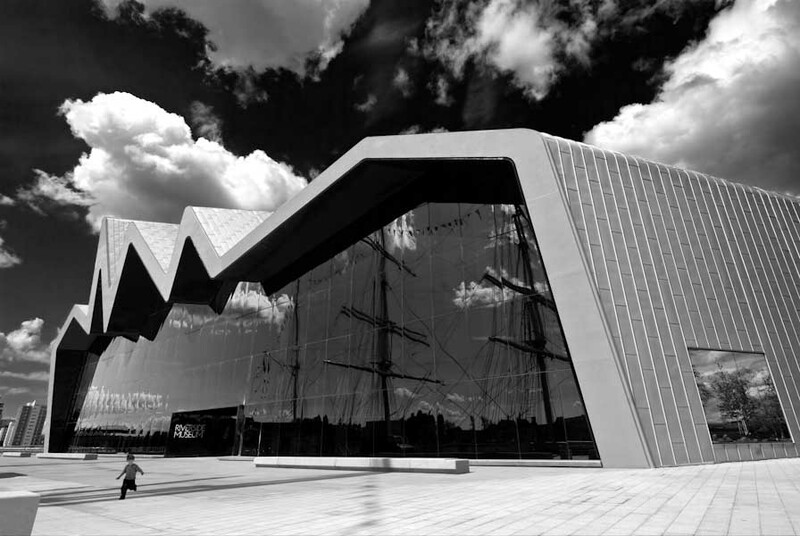 e-architect attended the Glasgow Transport Museum press preview on the 9th of June 2011, which kicked off with a speech by Gordon Matheson, Leader of the City Council. 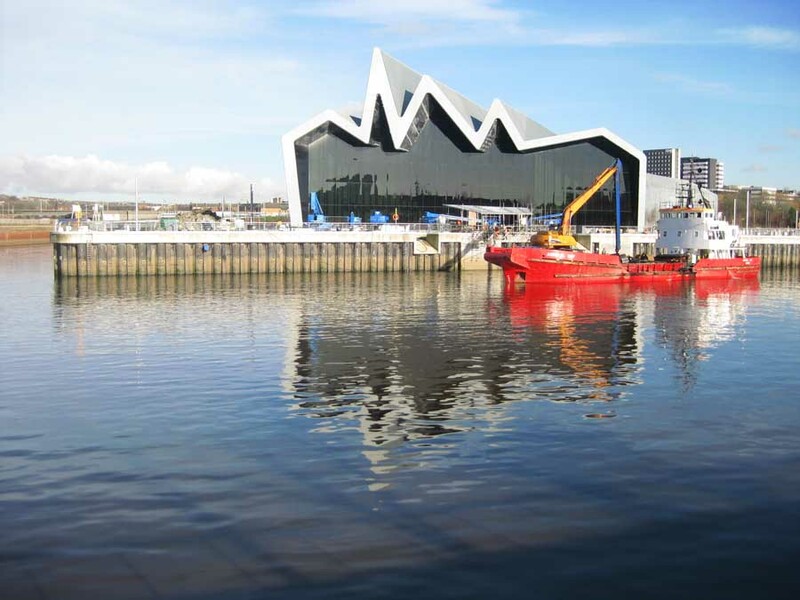 “Being Glasgow we wouldn’t except anything other than world class”. 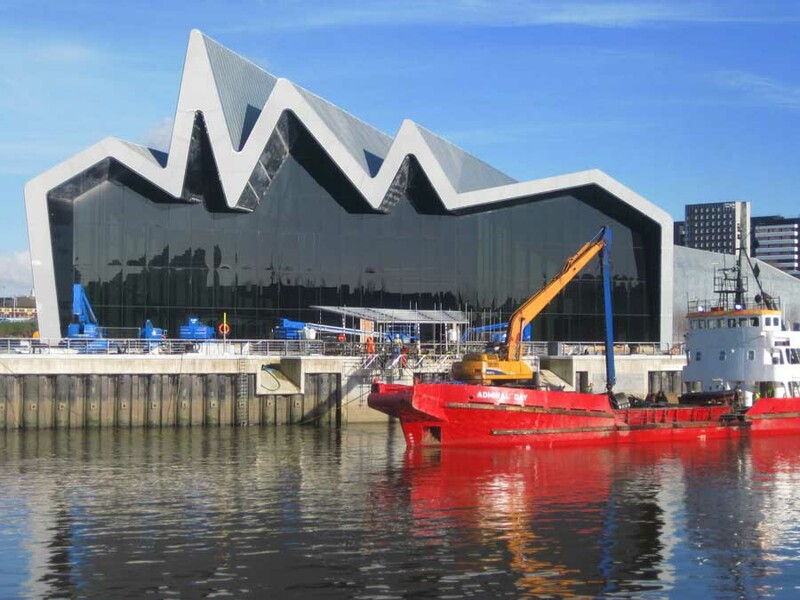 He went on to describe the new building as “A beacon on the Clyde”. 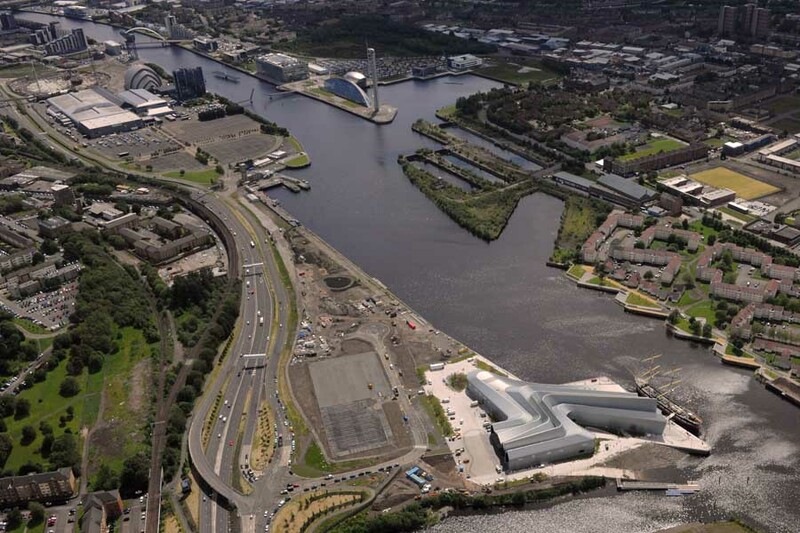 People often ask him “Is this Glasgow’s Goggenheim? 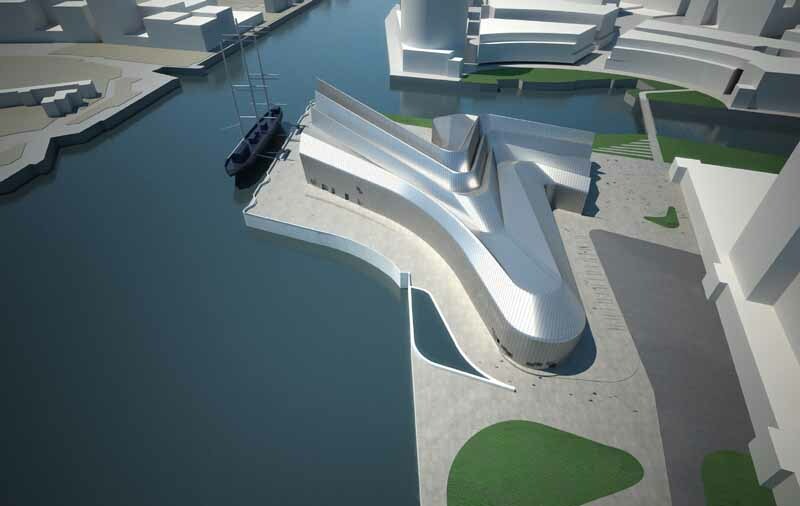 We don’t need a Guggenheim. 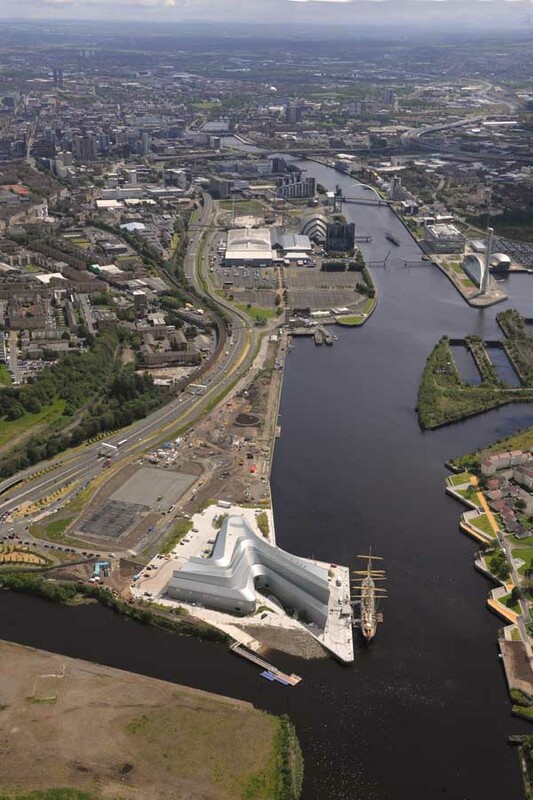 Glasgow is Scotland’s cultural powerhouse already”. 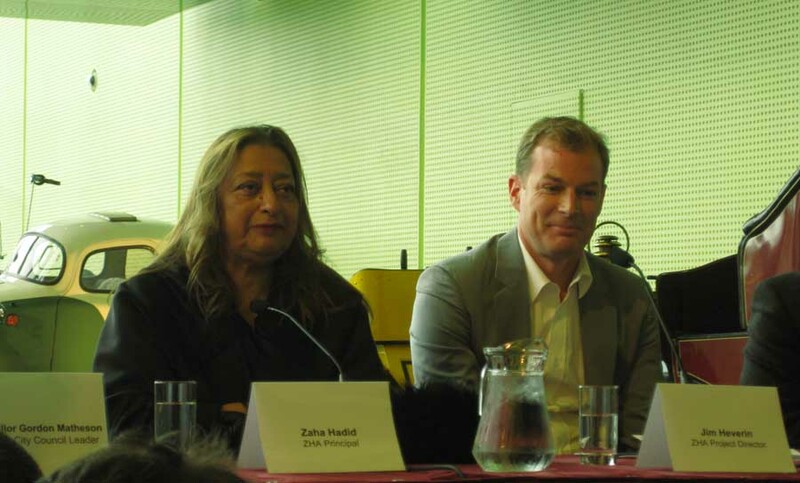 He thanked Zaha Hadid profusely (twice calling her Ma’am) for her “creativity, energy, passion and committment to my beloved city”. 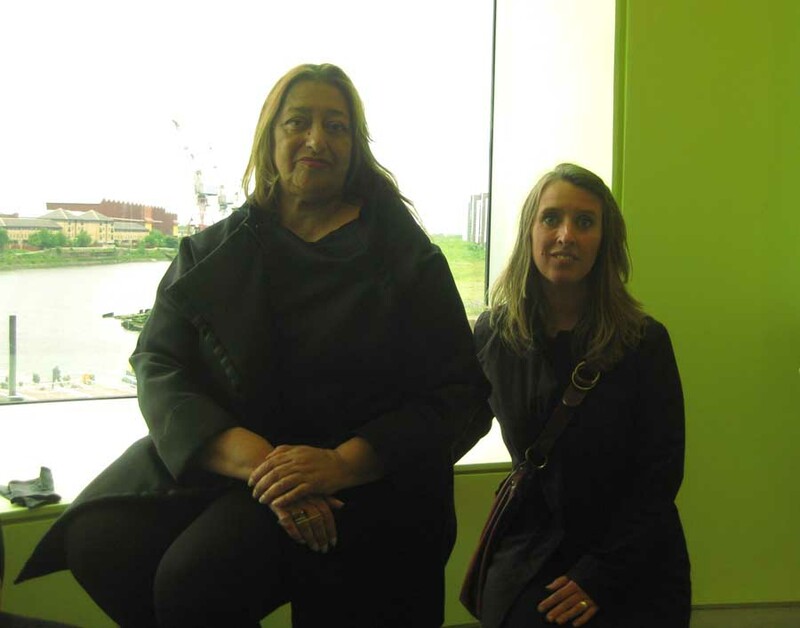 Next up was Zaha Hadid. 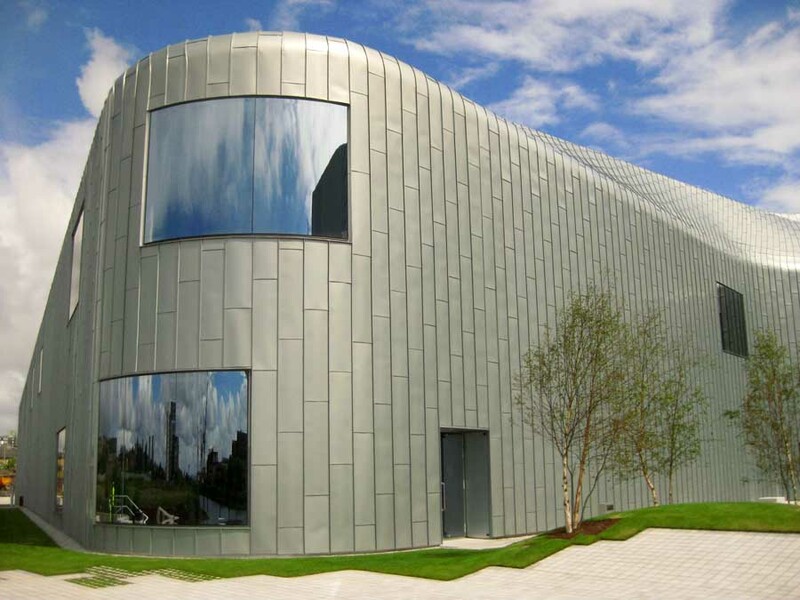 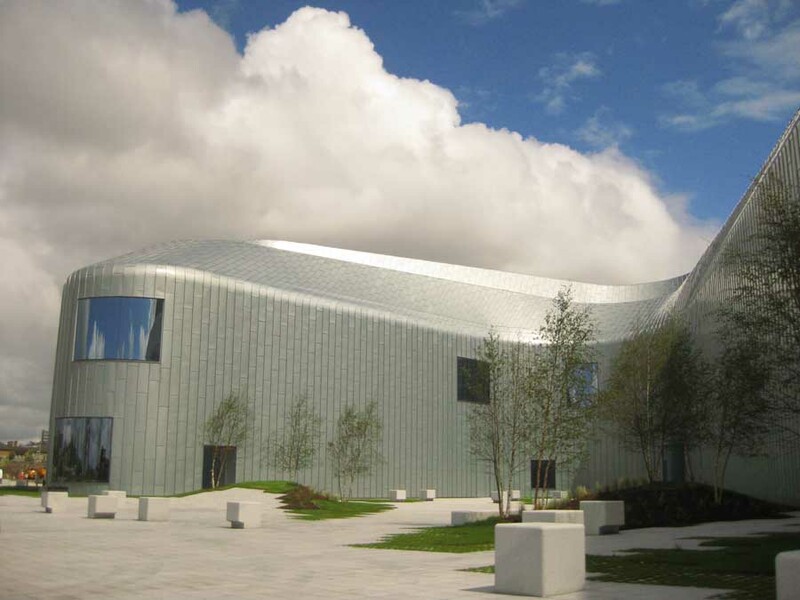 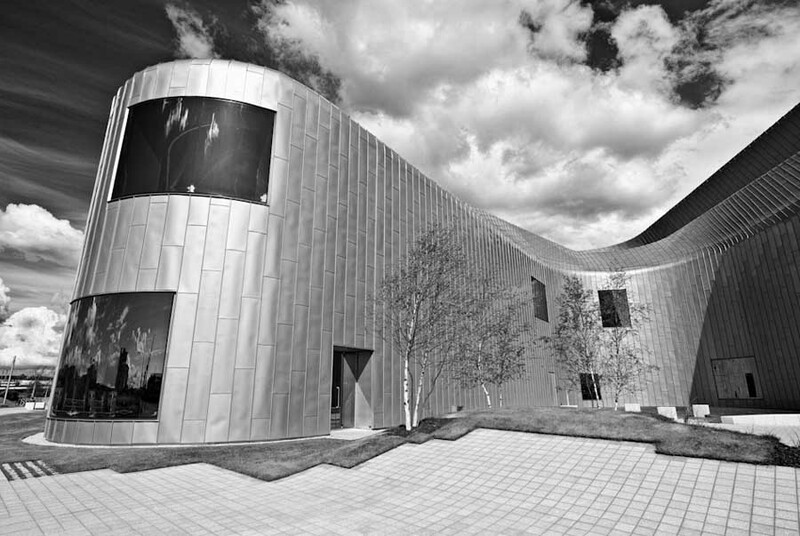 “It is our first cultural building in the UK. 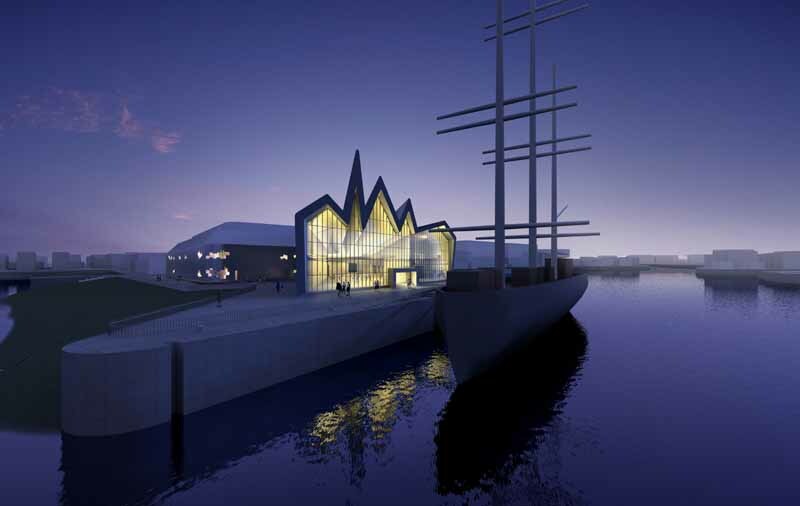 I’m really honoured, the Scots have given me two projects” [the other is Maggies Fife in Kirkcaldy]. 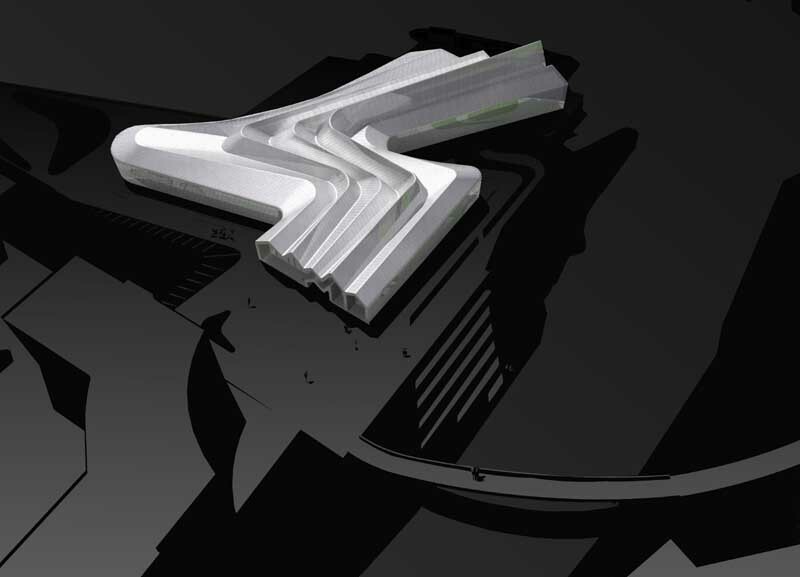 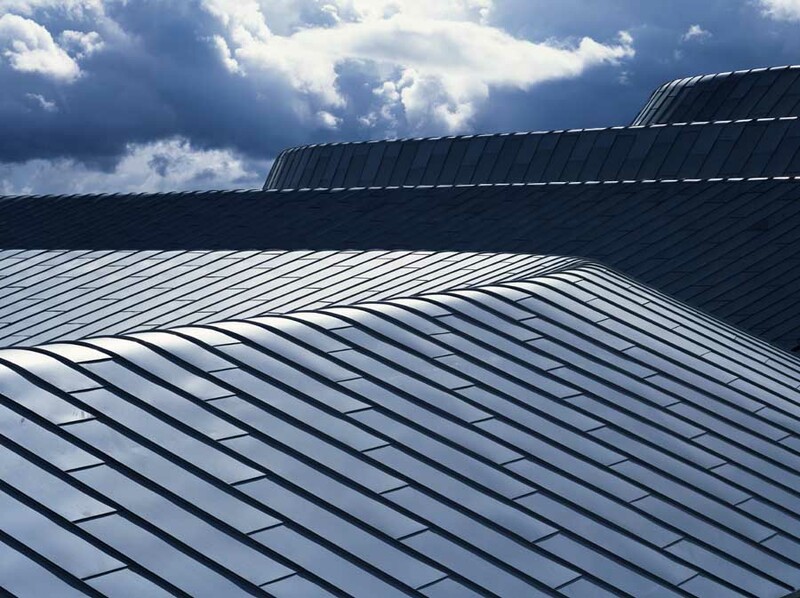 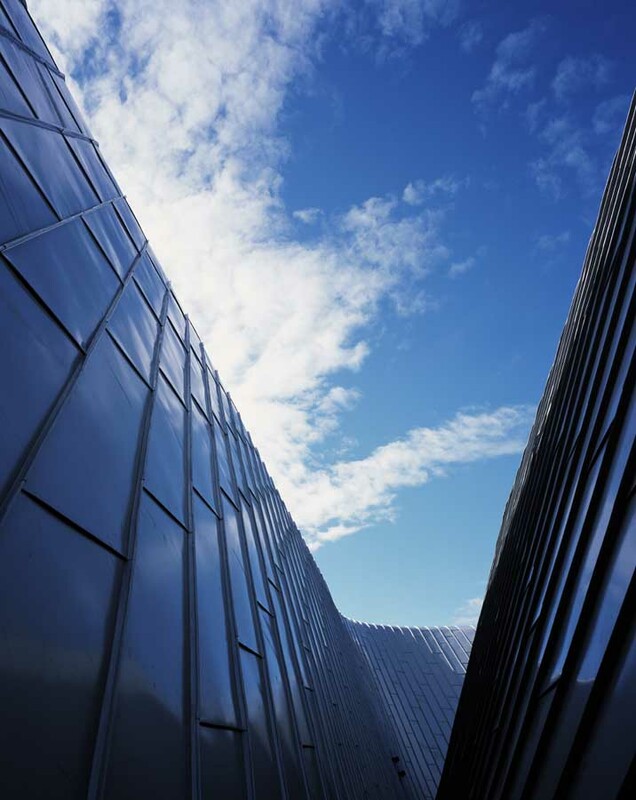 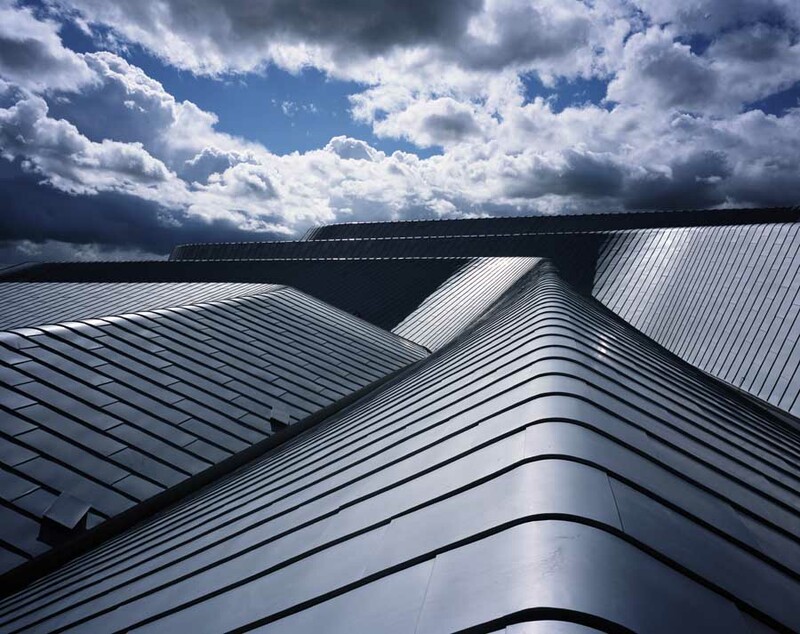 Zaha went on to say “It is very different from many of our other projects. 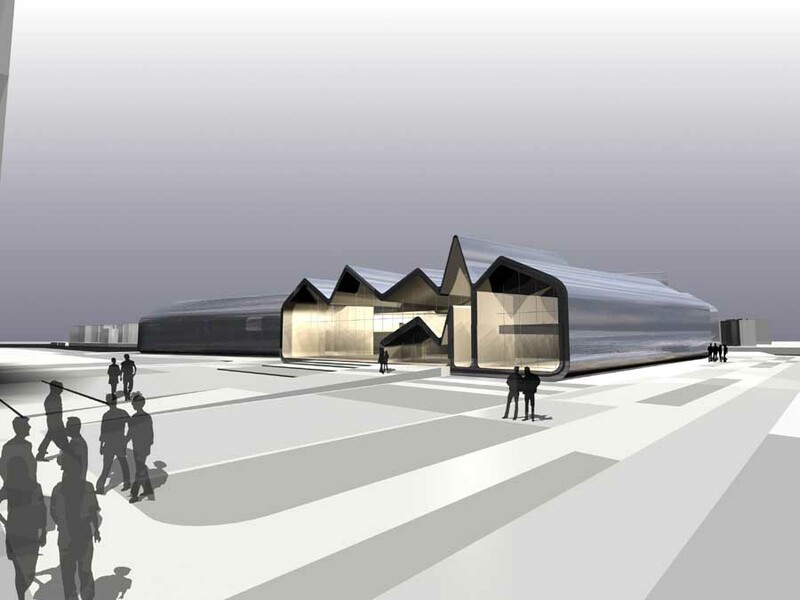 We are taking on this idea of the shed, the station, the train station. 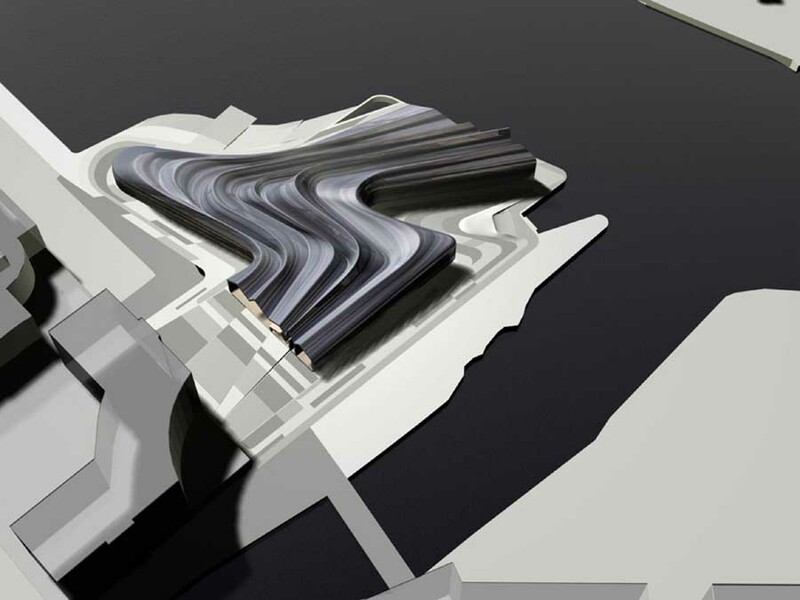 It is a fluid space”. 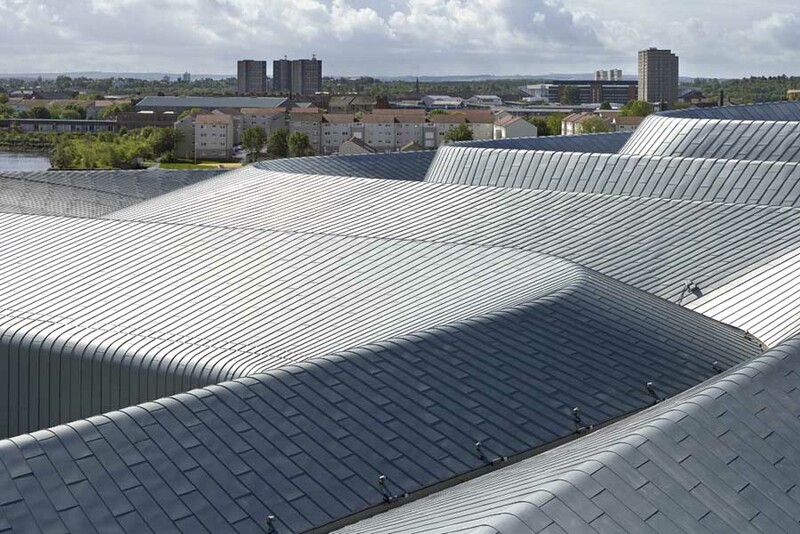 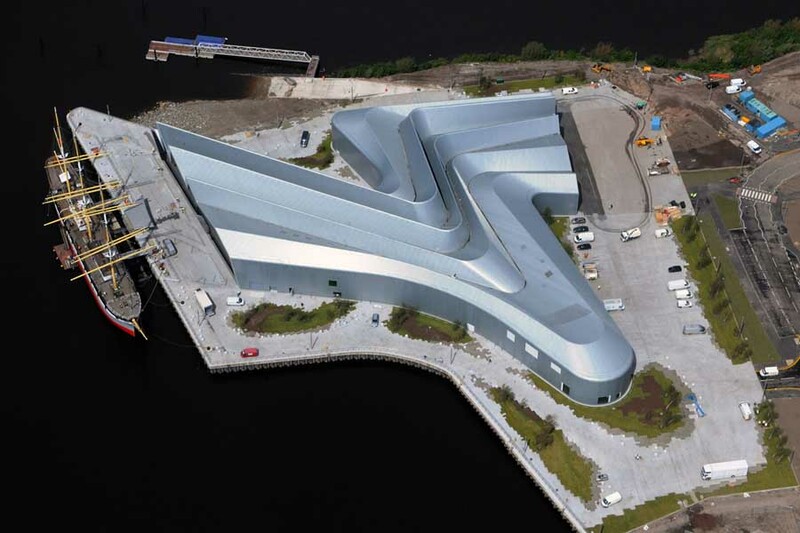 She elaborated on this fluidity – in the aerial images you can see the building is formed by a warped series of extrusions which related back to the ‘pleated’ sheds typical of the River Clyde shipyards – saying the extrusions pick up on motorways winding through the countryside, or trains winding along tracks. 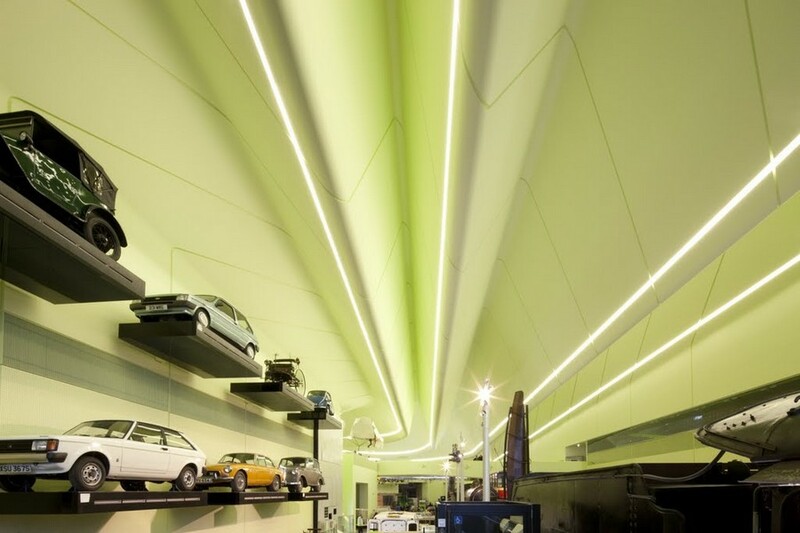 “If you ask me about the colour…I will restrain myself from saying why” – in fact the light green colour of the interior was THE talking point of the day!. 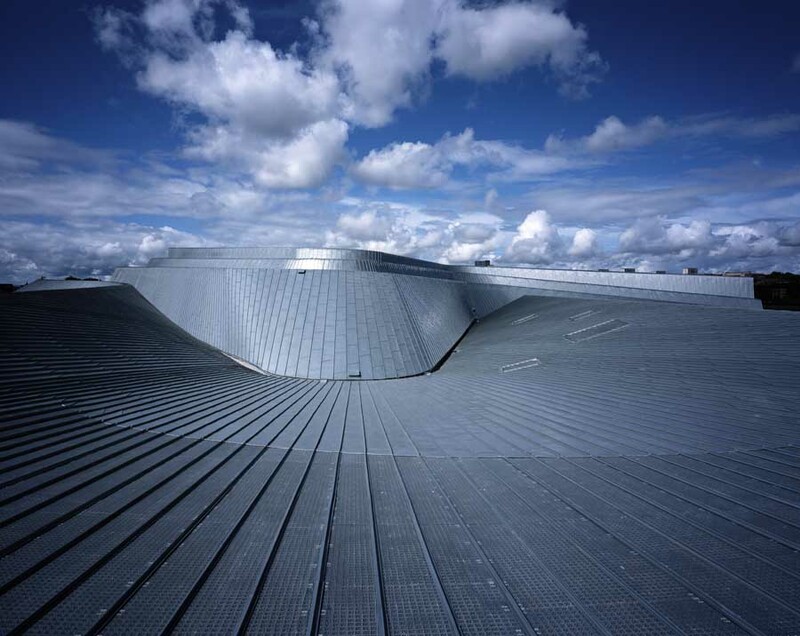 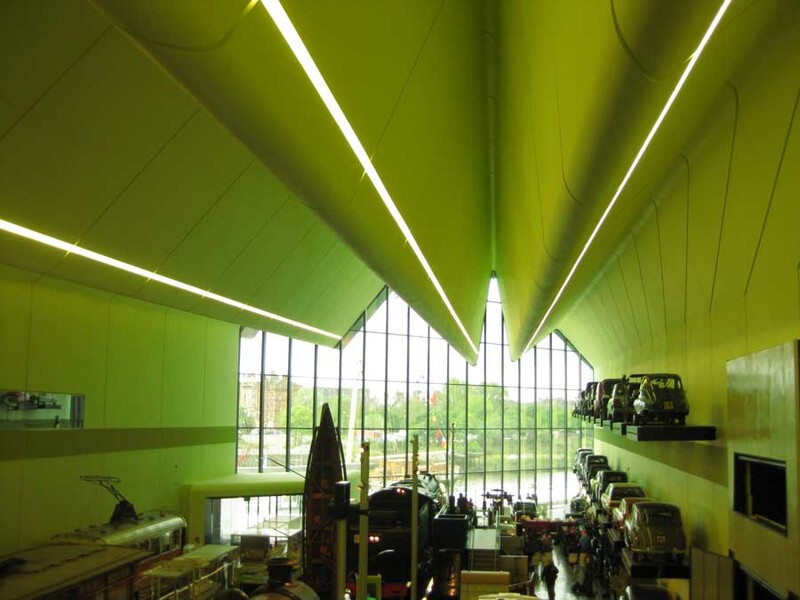 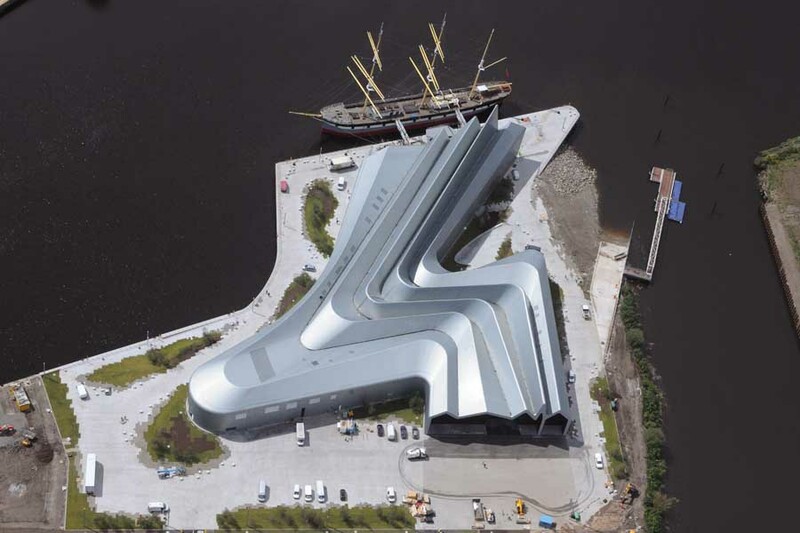 Zaha went on to say the Transport Museum “is quite playful, not like an art gallery, not a white box”. 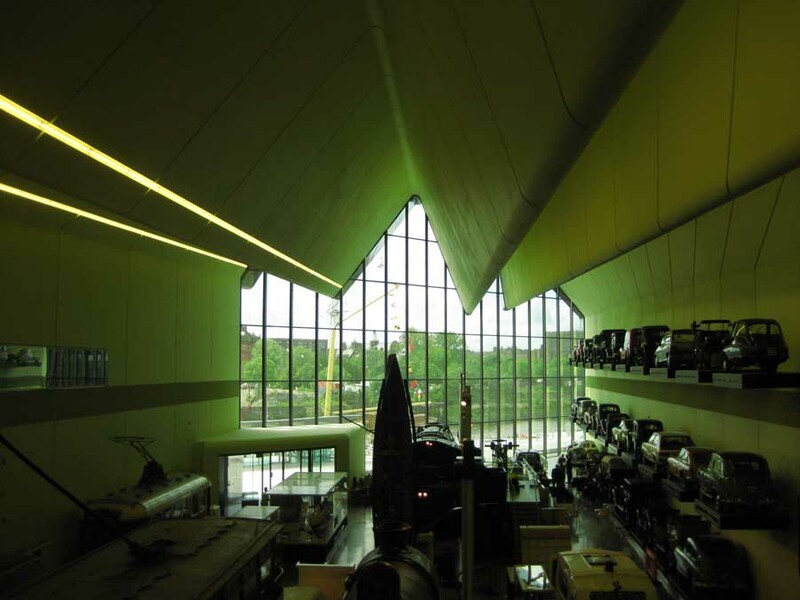 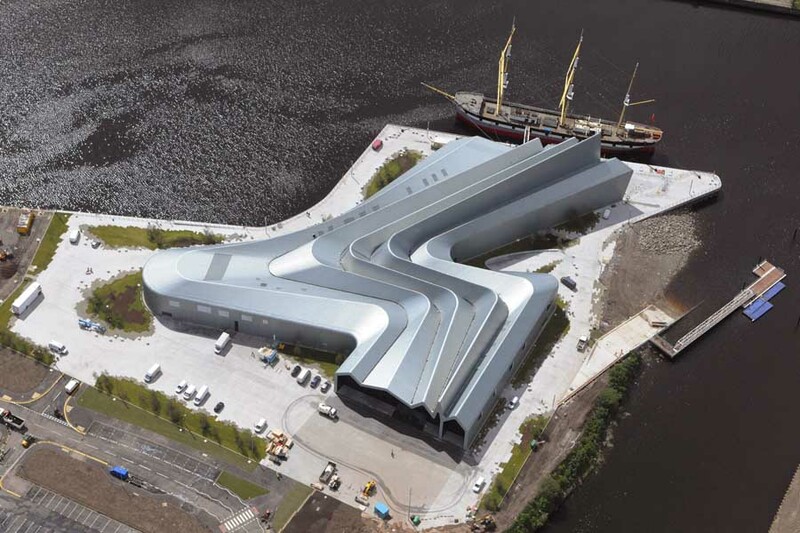 The Riverside Museum had to be designed from the inside out. 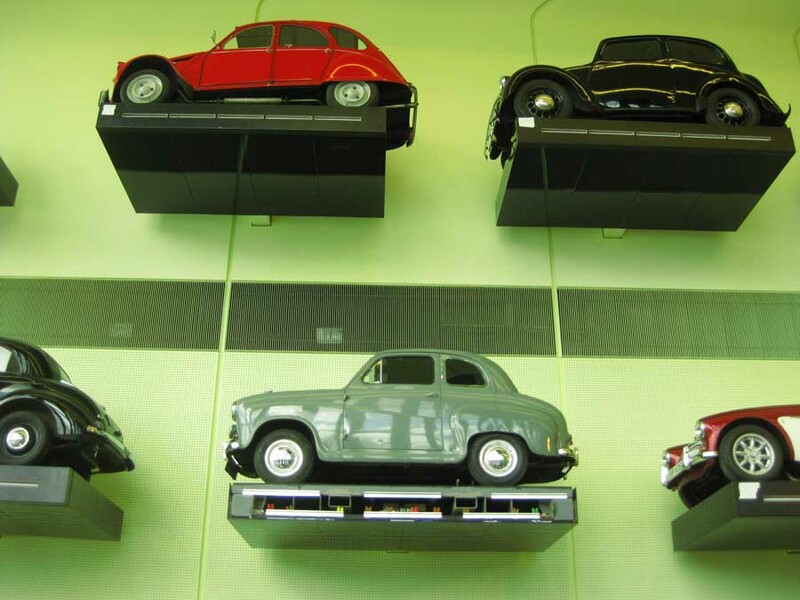 It is not about the objects per se but about the objects’ stories. 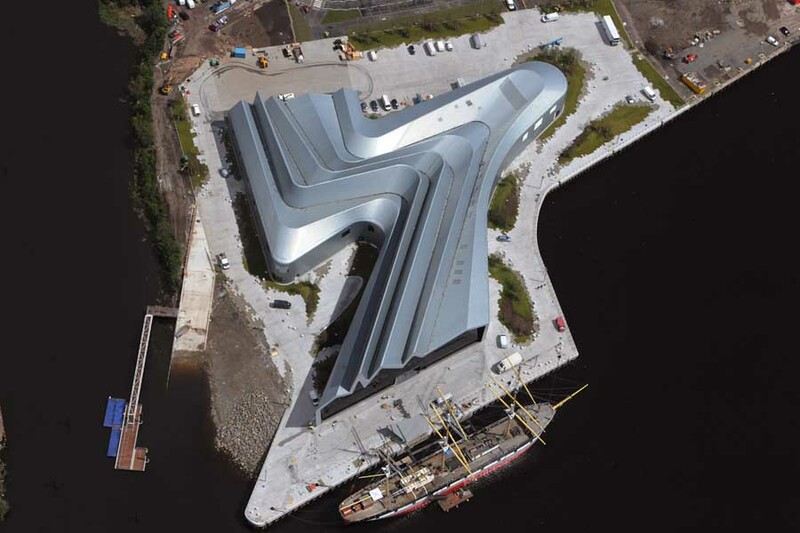 Jim went on to say the “design both addresses the city and the river” alluding to the fact that the building has two entries, though the northern access served by vehicles is dominant. 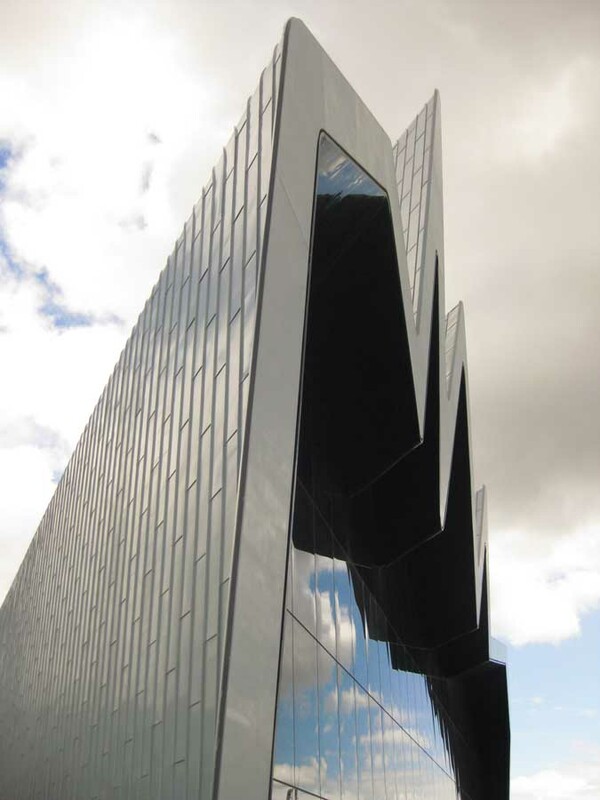 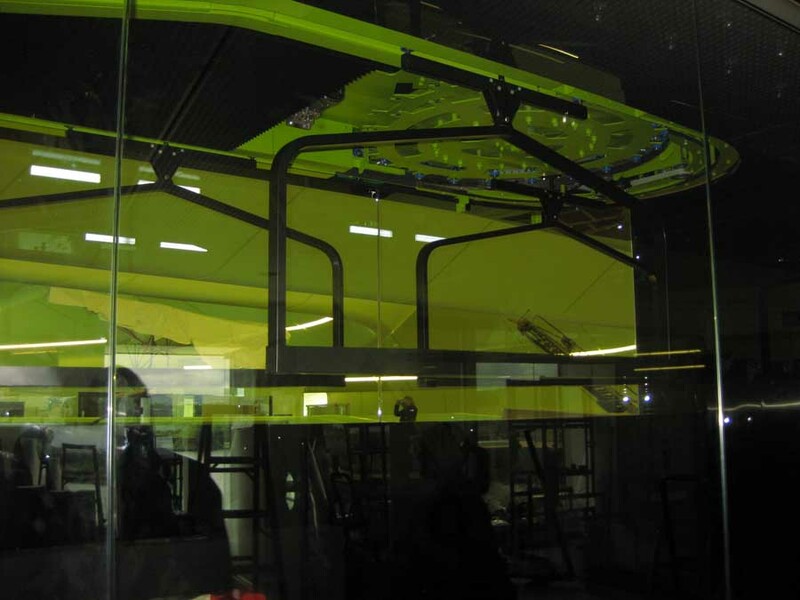 “The central spine is a great concept, column free, the heart of the building”. 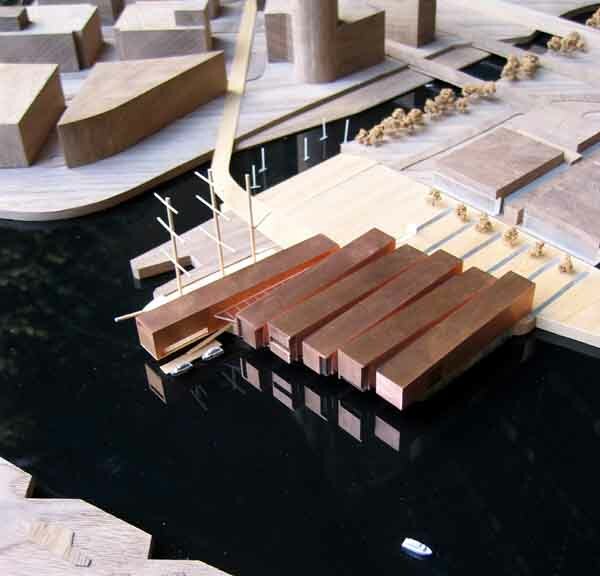 Due to the relationship with the river there is “no back of house, you walk round it, there is no plant externally, it is all in the roof space”. 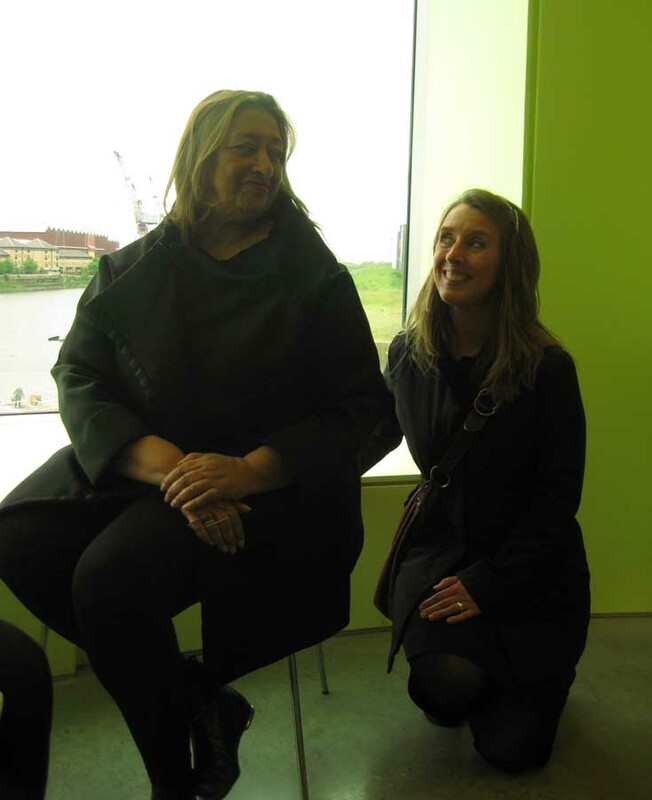 Then to what is often the most interesting part of a press preview, the questions. 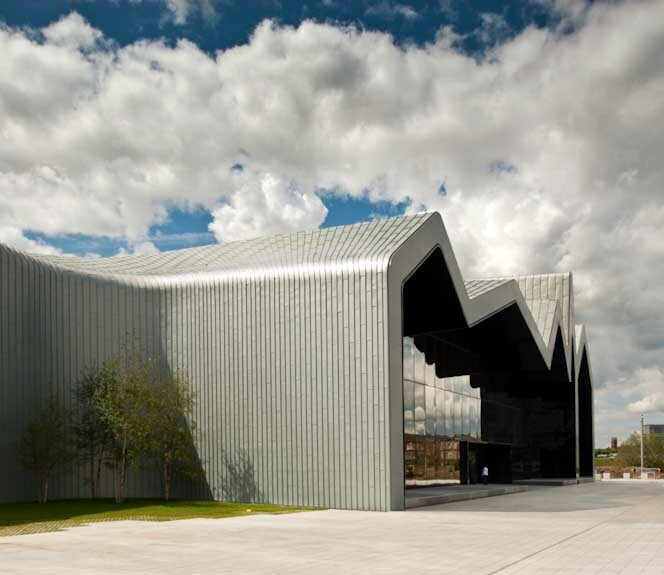 We were lucky, there was a warm-up act here, someone asked where the picnic tables were at the Riverside Museum. 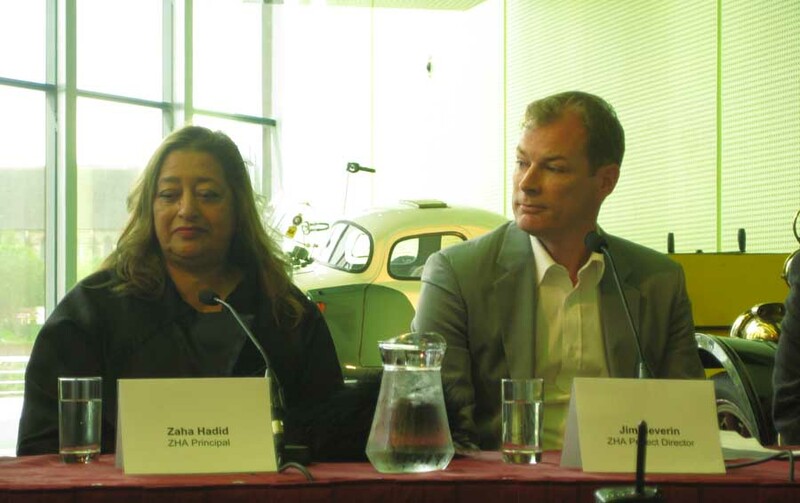 Zaha was amused, and not alone, but the ripple of amusement dwindled as the questioner refused to give in…Jim had to go further into detail about the granite landscape elements, but Zaha brought the matter to a finish with her offer to design a mobile picnic table that the questioner could purchase and take along. 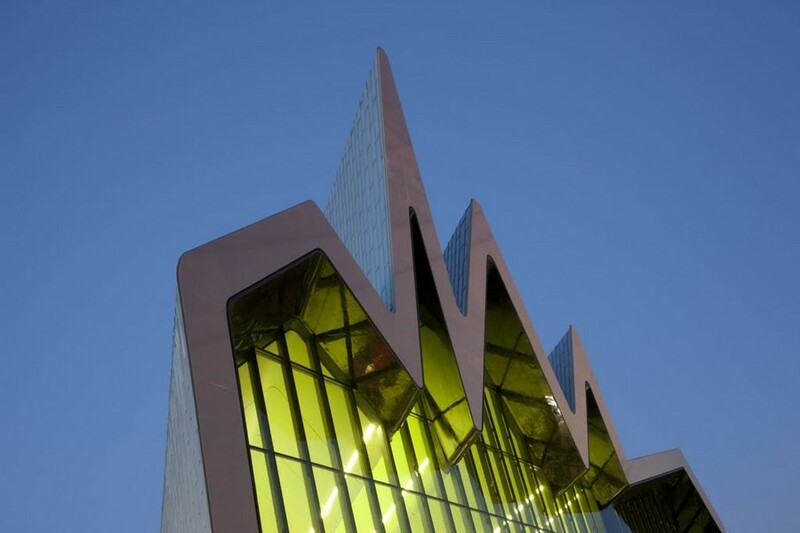 The next questioner asked Zaha Hadid why she thought the Glasgow Transport Museum was ‘different’ than her other projects. 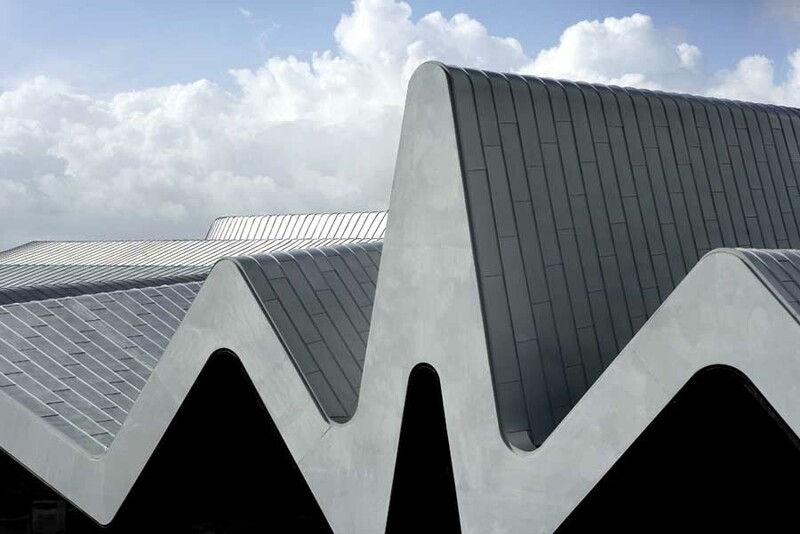 Zaha said “it is like a soft shed” and that maybe it was similar to the building for BMW (in Germany, also by the same Project Architect). 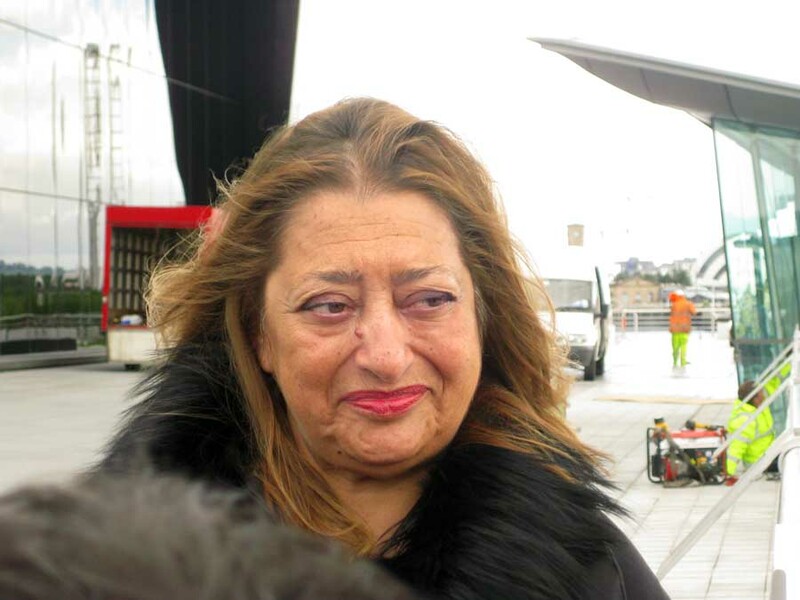 Hadid went on to say “I’ve been coming here for a long time”. 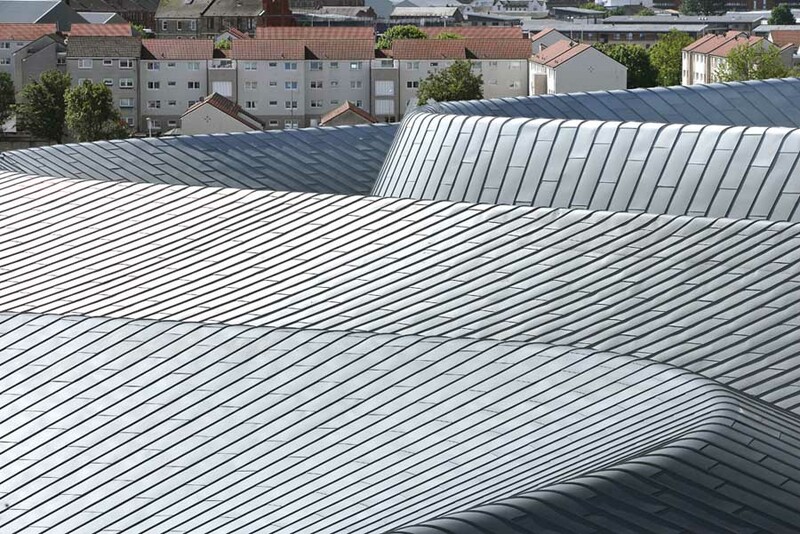 A really interesting point for me (ref. 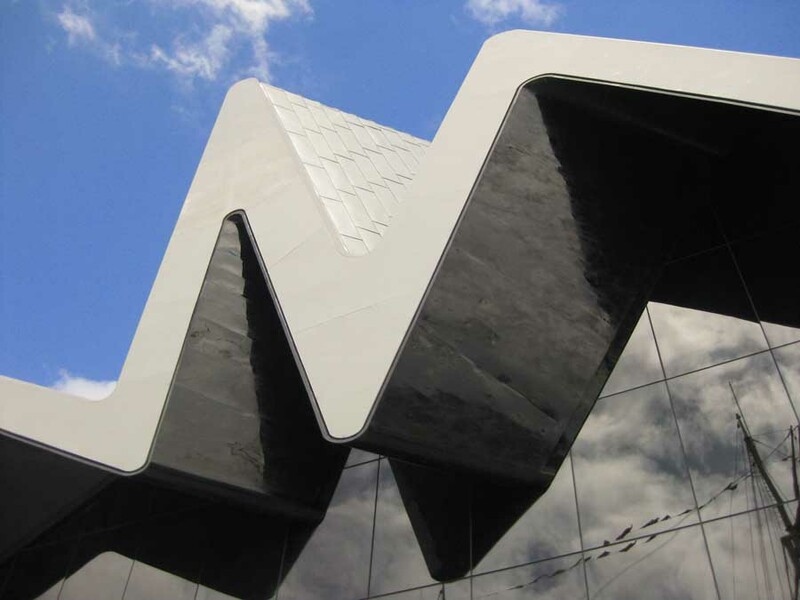 various iconic architecture articles) was her statement that “many architects believe the brand should be repetitive. 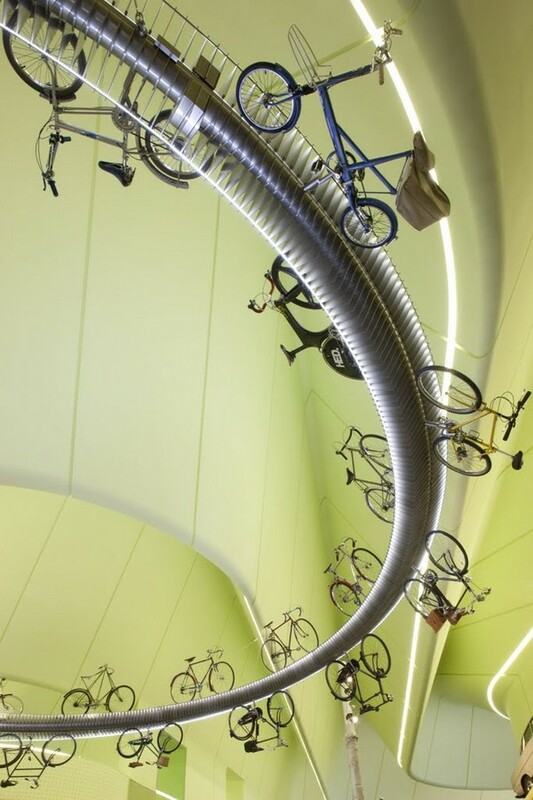 We don’t believe that”. 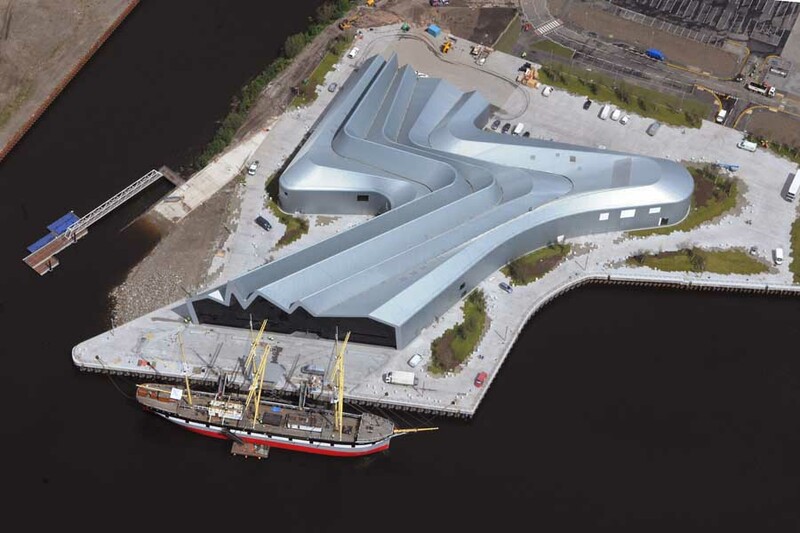 The next questioner asked how much involvement was there by Zaha on the Riverside Museum. 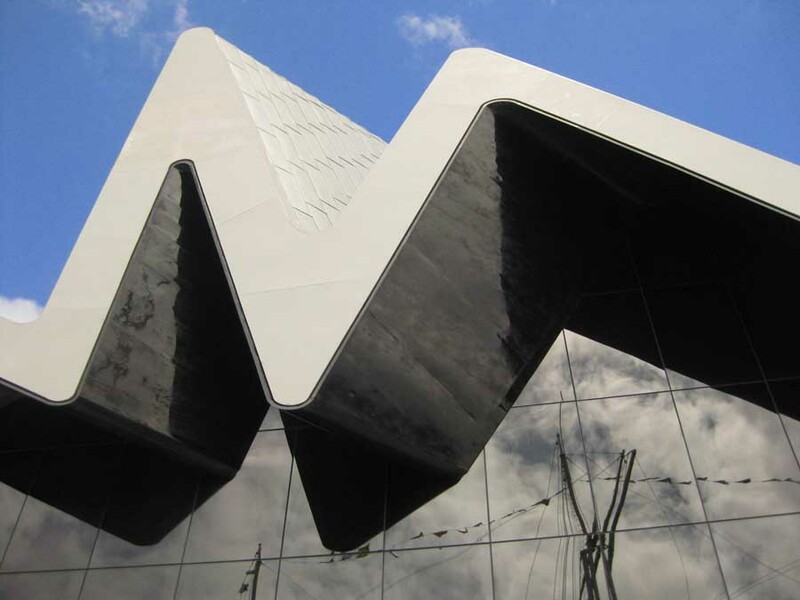 Hadid replied “The story of any success is to delegate. 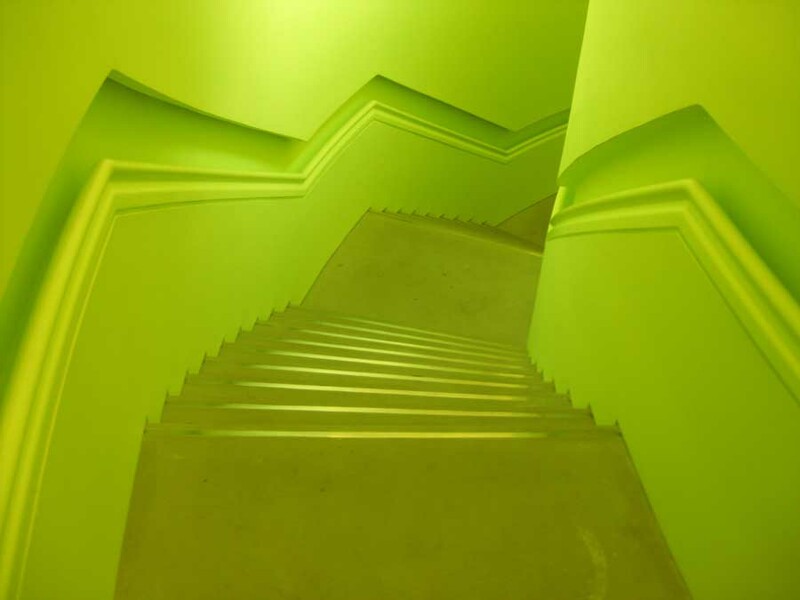 I’m a pain to the team, I nitpick. 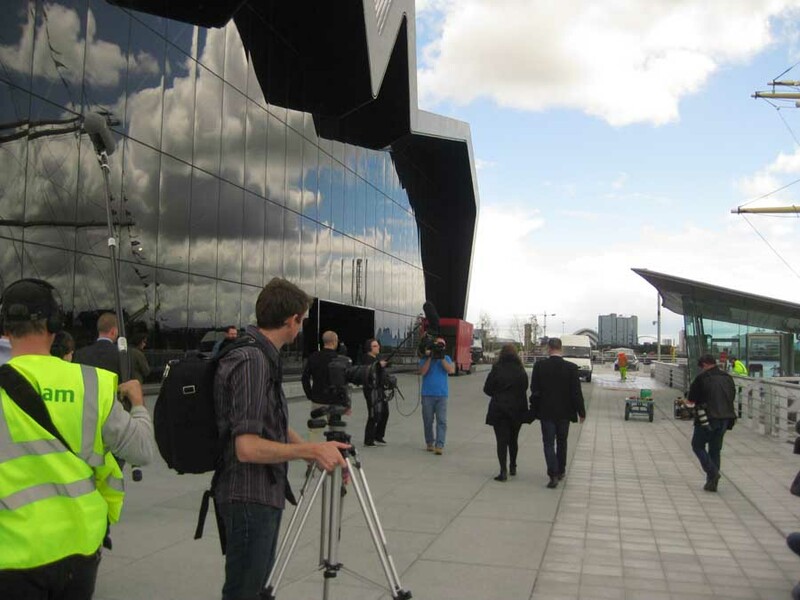 I don’t think these guys want me to interefere too much”. 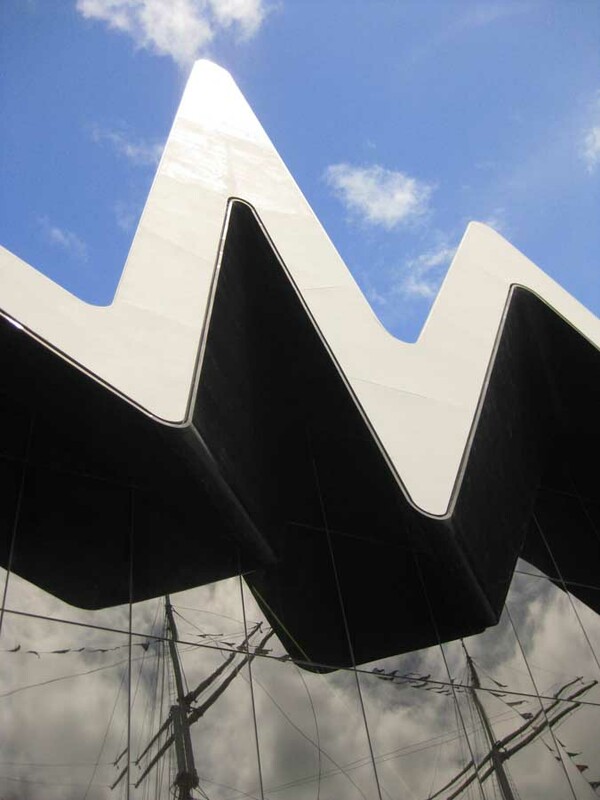 The final questioner asked why equipment blocked the Riverside Museum windows to which Zaha – and indeed many of us – appeared puzzled. 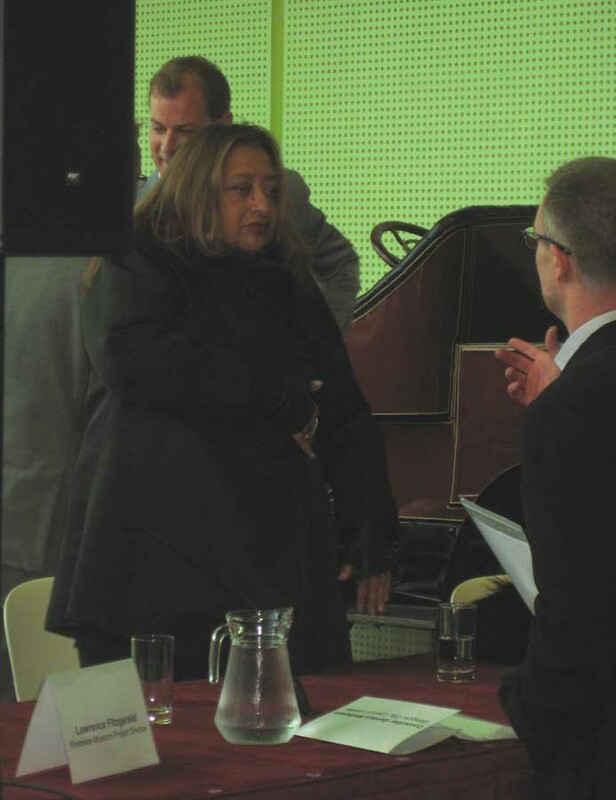 She handled it with a quick snap of humour and that was questions over. 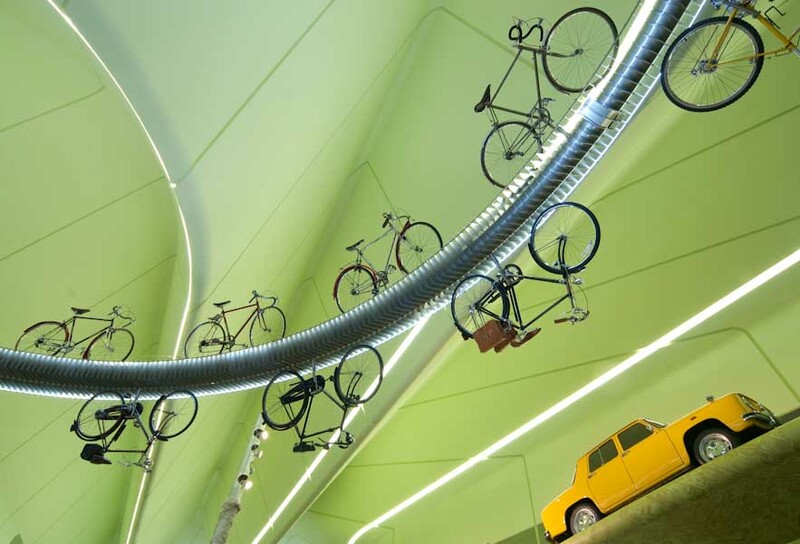 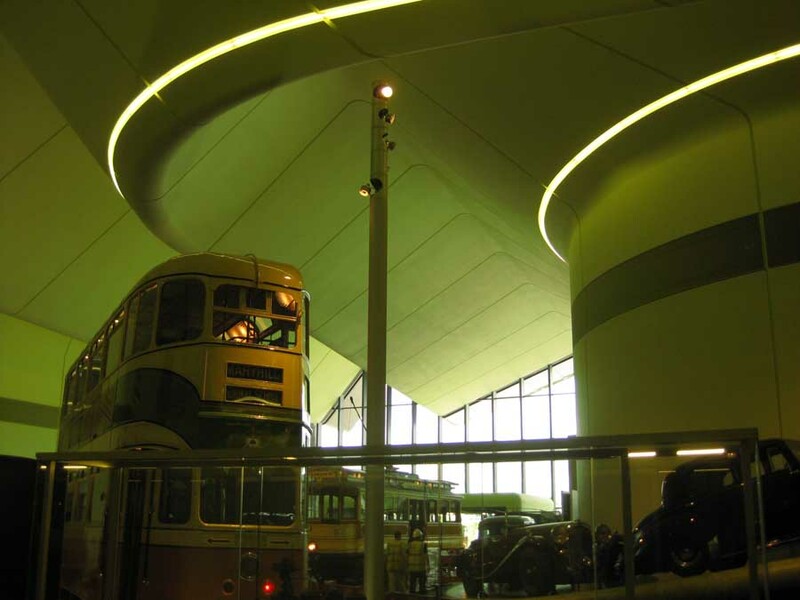 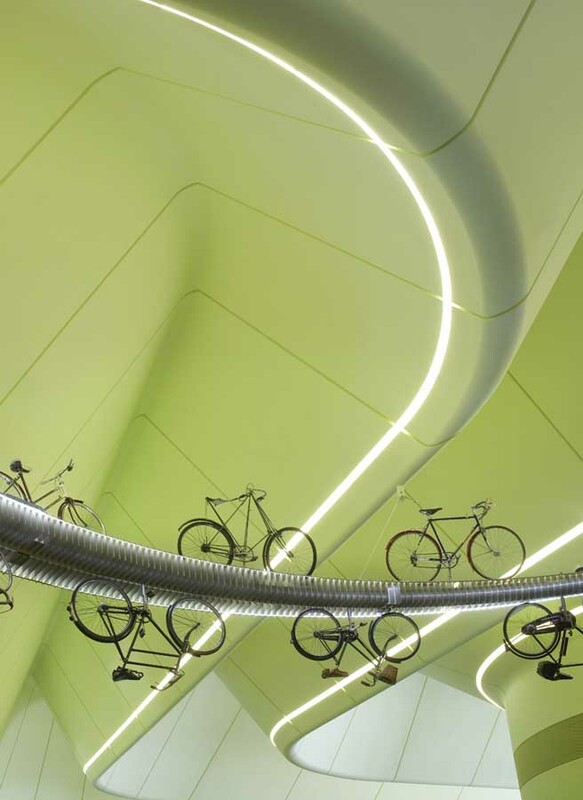 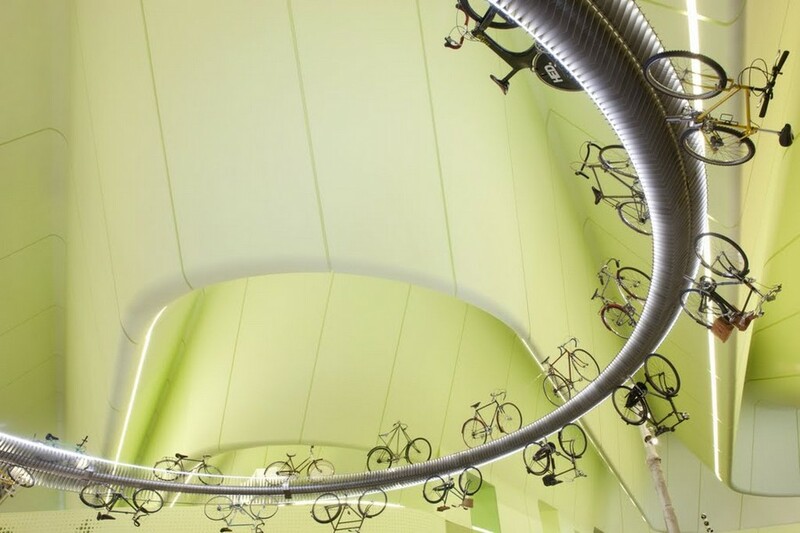 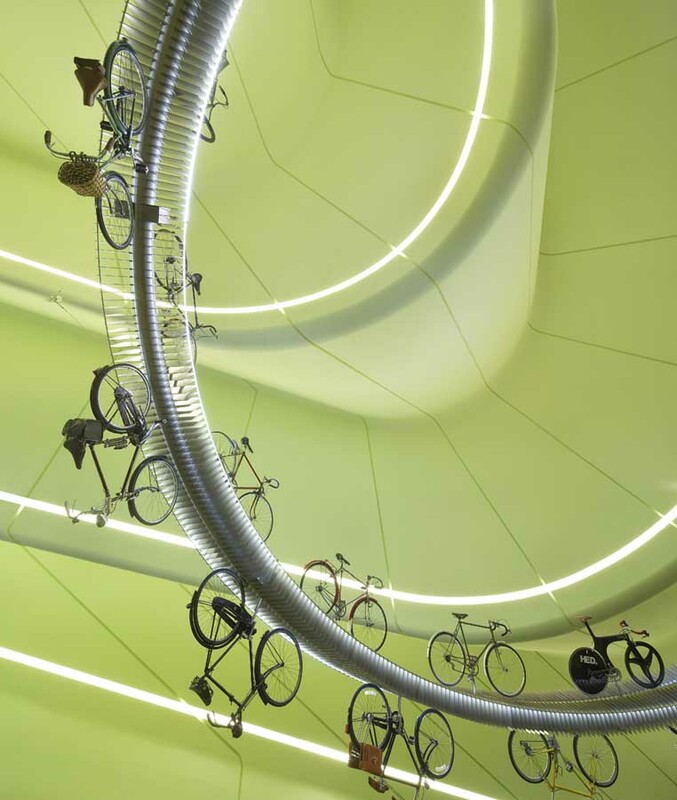 Views on the Glasgow Transport Museum welcome – info(at)e-architect.co.uk. 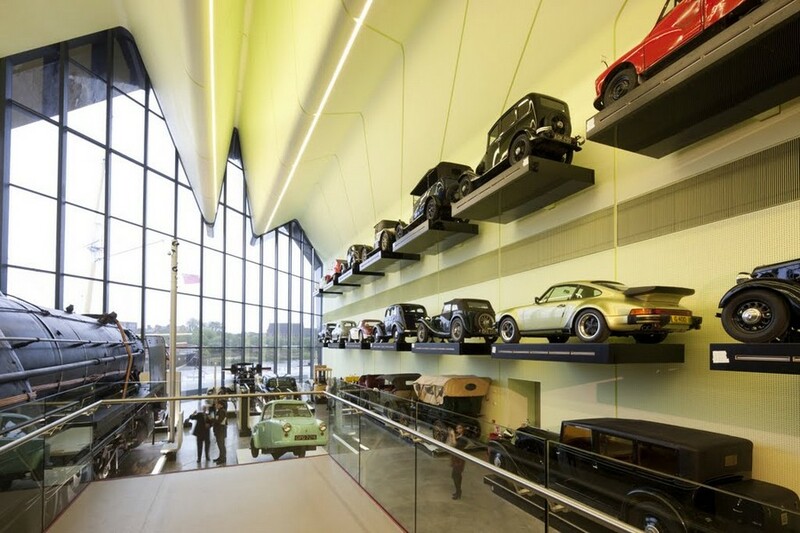 Compared to the old building this is a major step up, an enjoyable building that shows much more of the collection, and in a more engaging way. 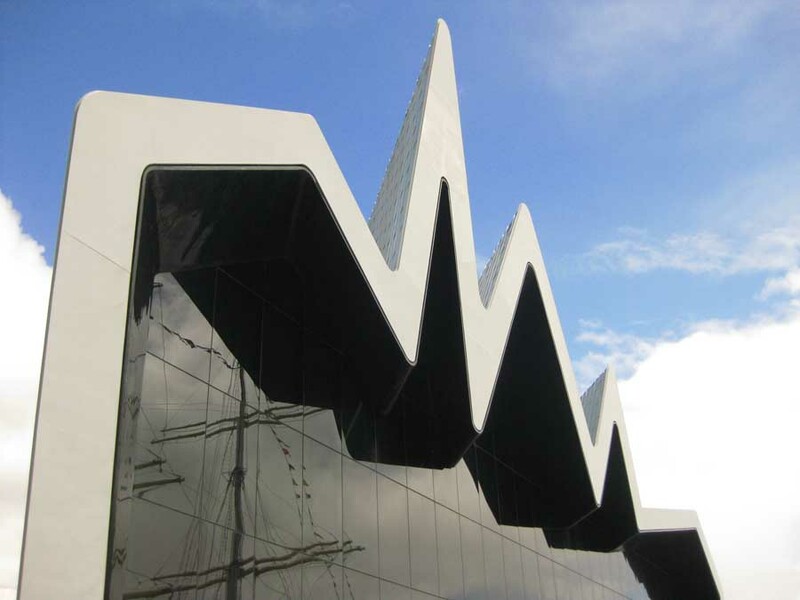 Glasgow seems to have a propensity for acquiring simple readable forms (aka ‘iconic buildings’) such as the Science Centre, the ‘Armadillo’, the Clyde Arc, all not far up the river from the Riverside Museum. 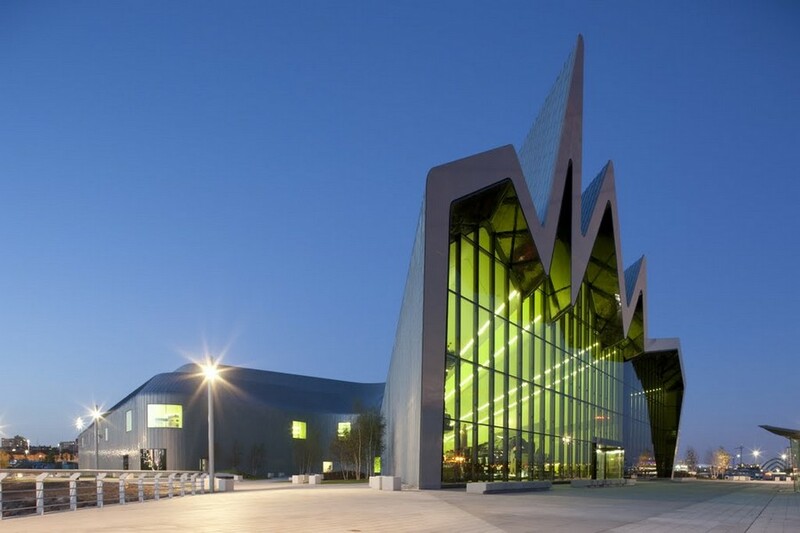 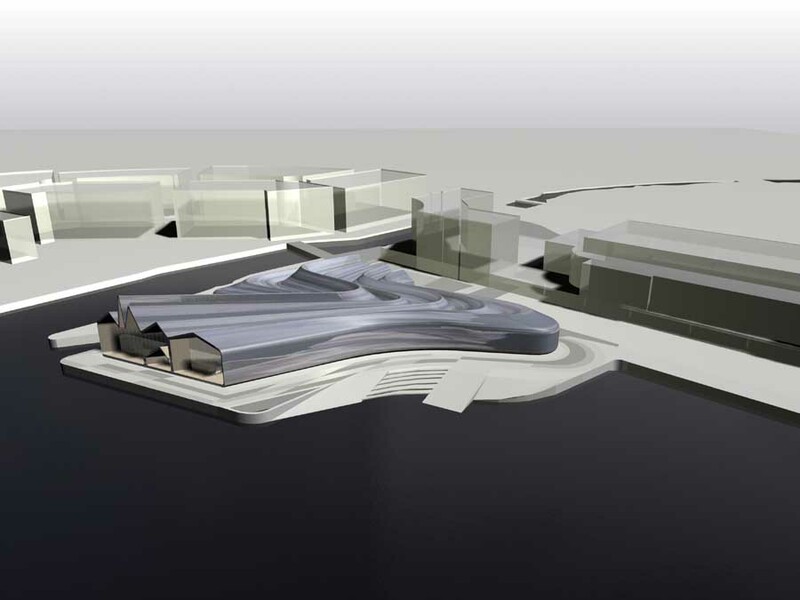 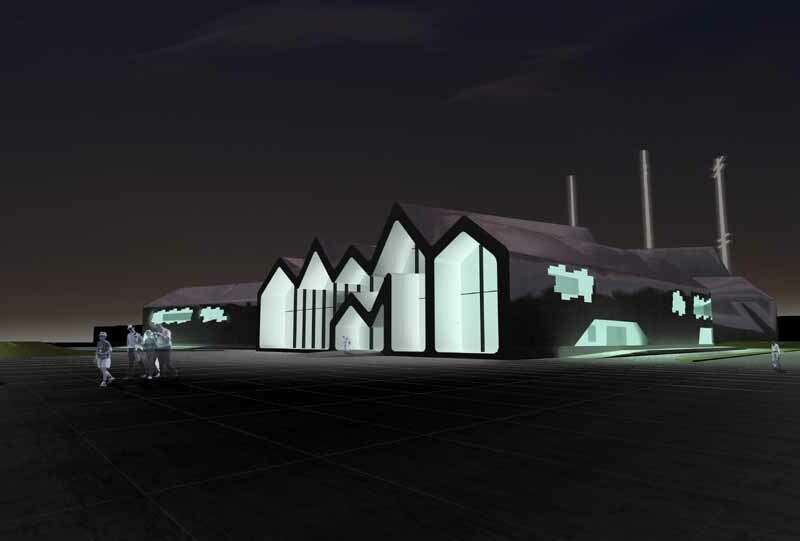 Concerns raised about the Riverside Museum seem to focus on the unrelenting green colour, the connection to other Clydeside buildings (not anything Zaha Hadid Architects could sort out – a macro issue for the Council) and the severity of the exterior. 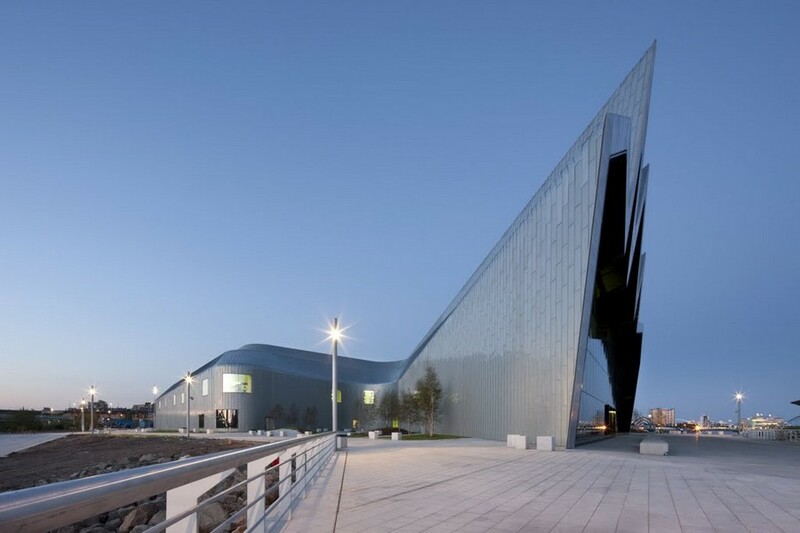 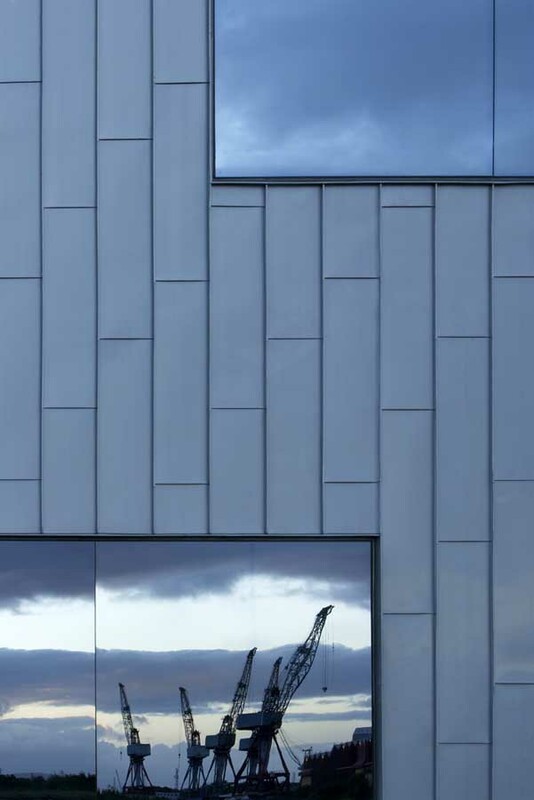 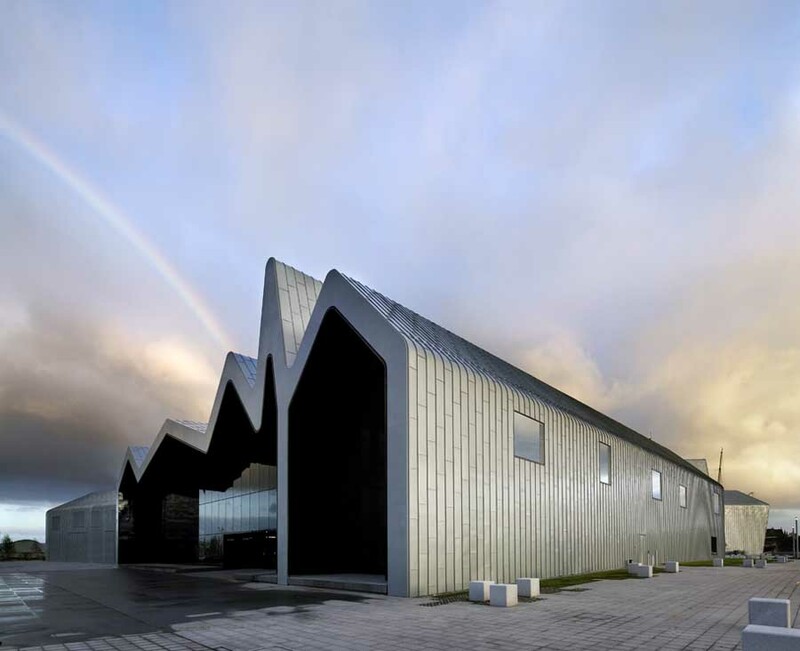 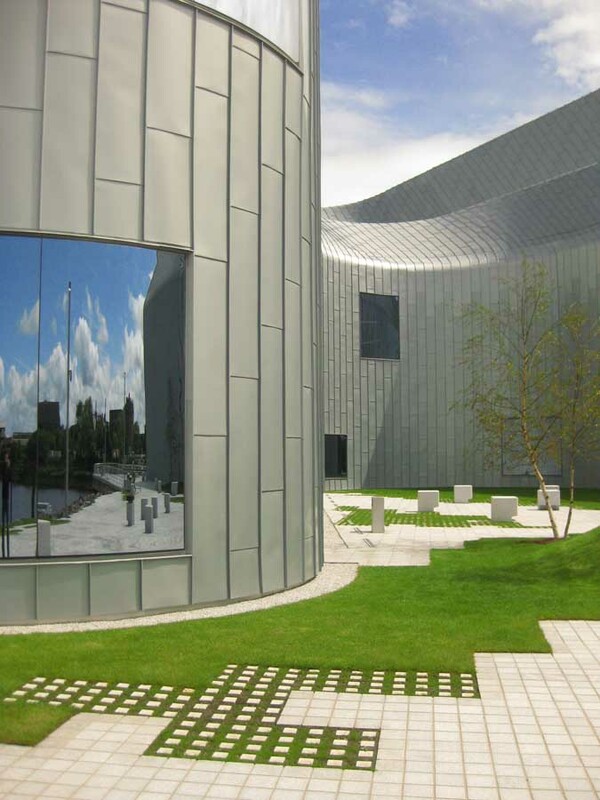 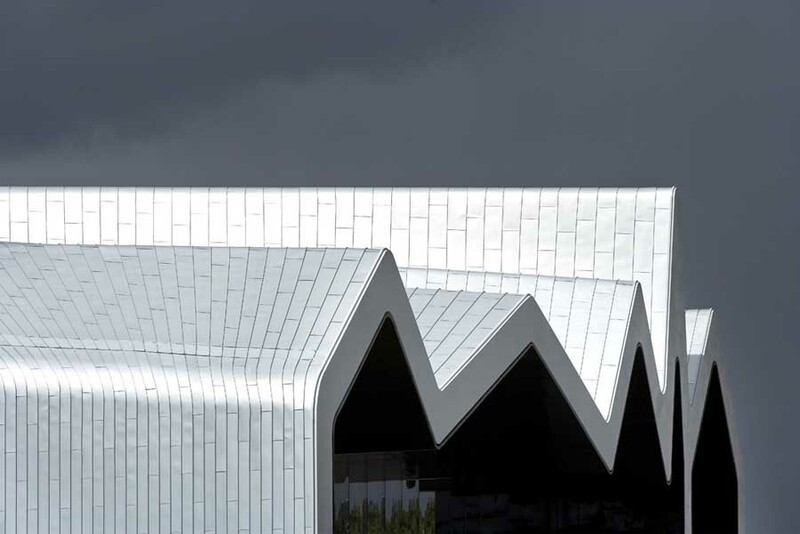 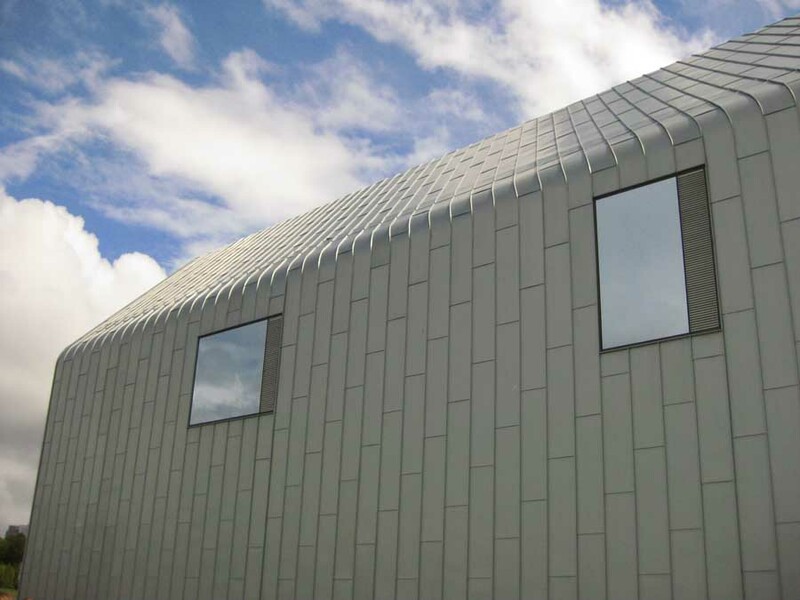 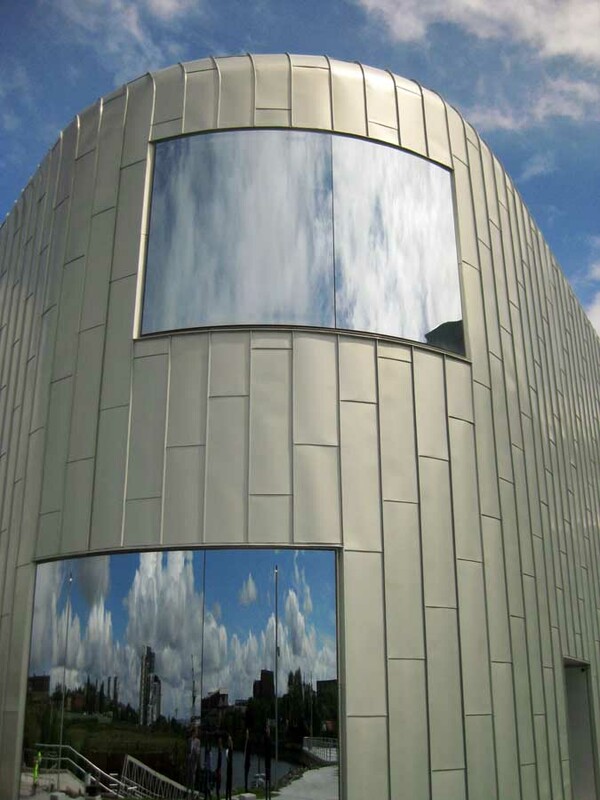 Re the last point it could be argued that the grey starkness of the Riverside Museum exterior picks up on the industrial landscape of the Clyde, indeed the sombre zinc facades feel appropriate when considered against Glasgow’s industrial heritage. 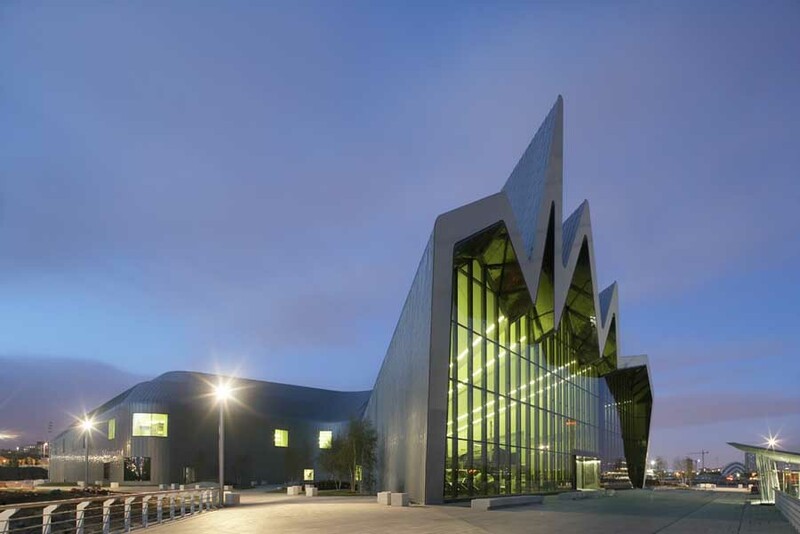 After all that is what this building is about, for me it is about letting the next generation know of Glasgow’s mighty record when it comes to transport – not just ships, but trams, steam engines and so on. 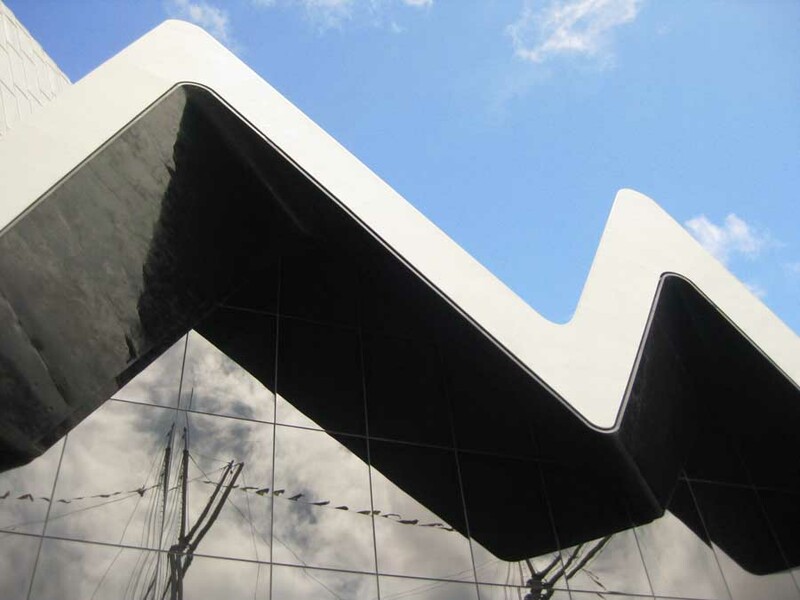 We took photographs of Zaha Hadid outside the Transport Museum building and were shown round by Project Architect Jim Heverin (with whom I served on an awards jury) followed by a brief meeting with Zaha Hadid.